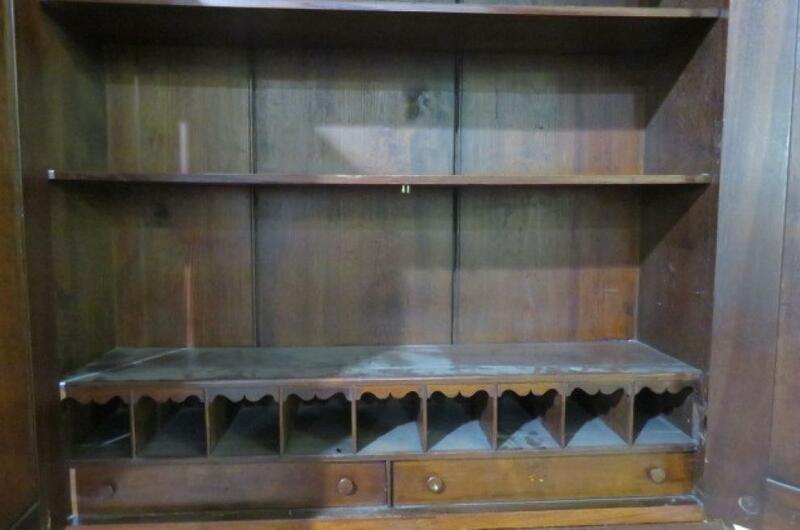 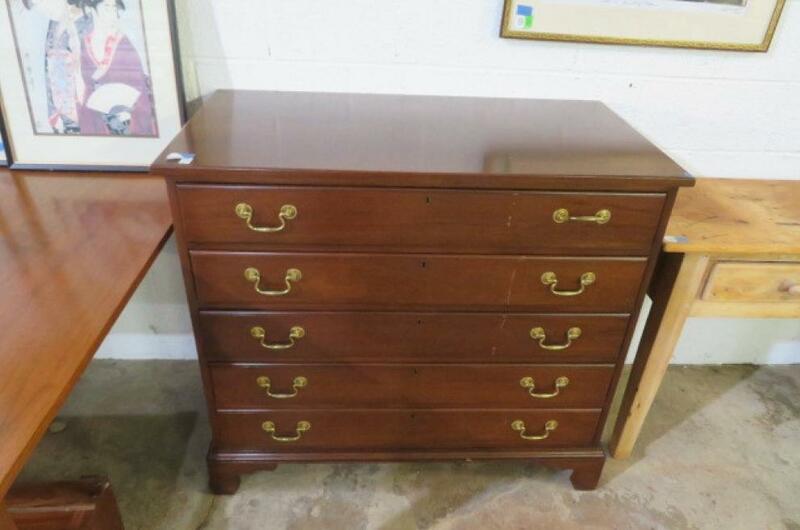 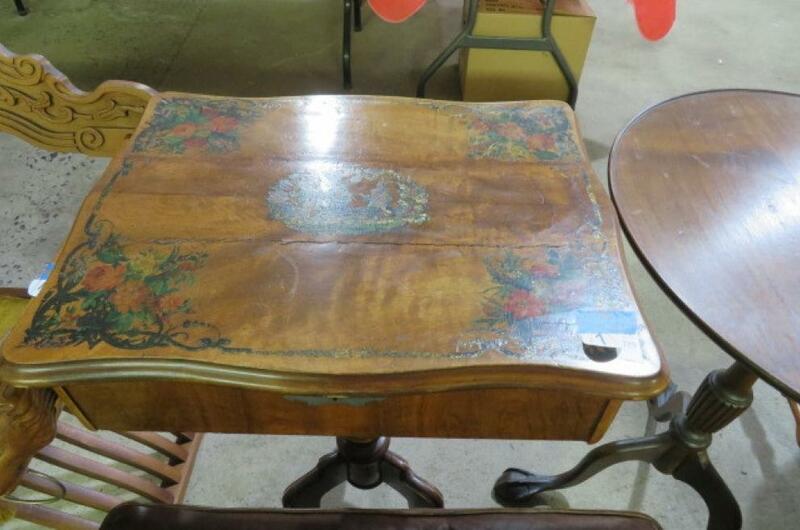 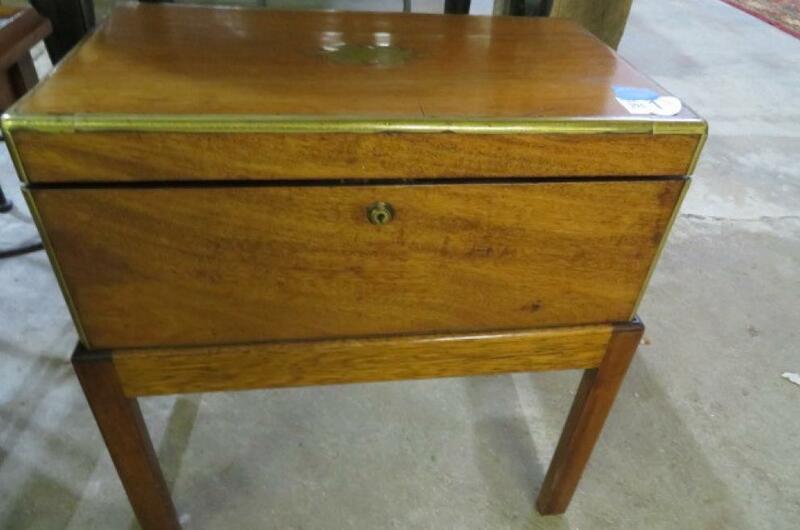 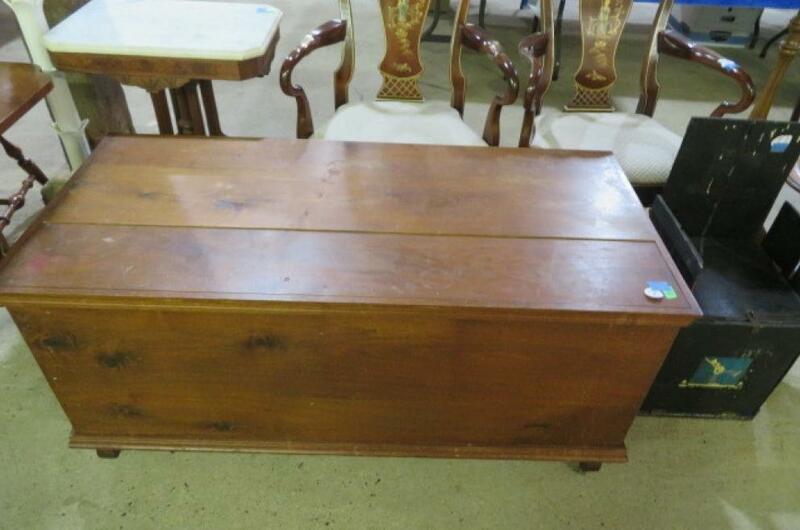 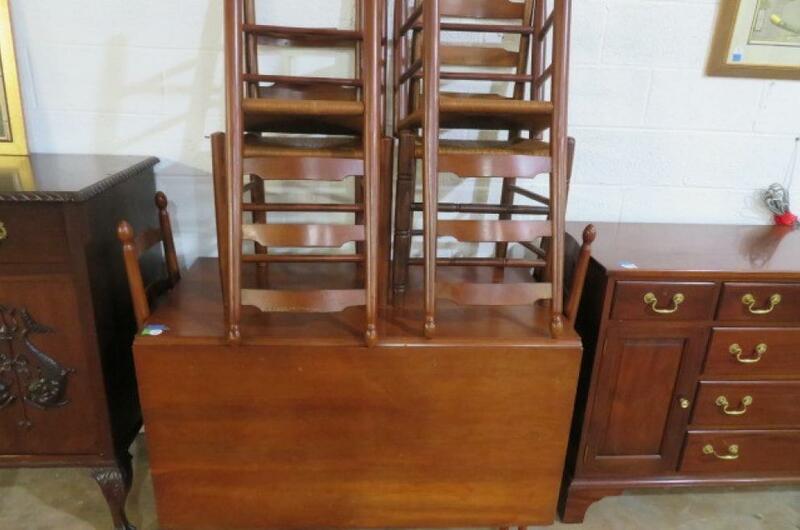 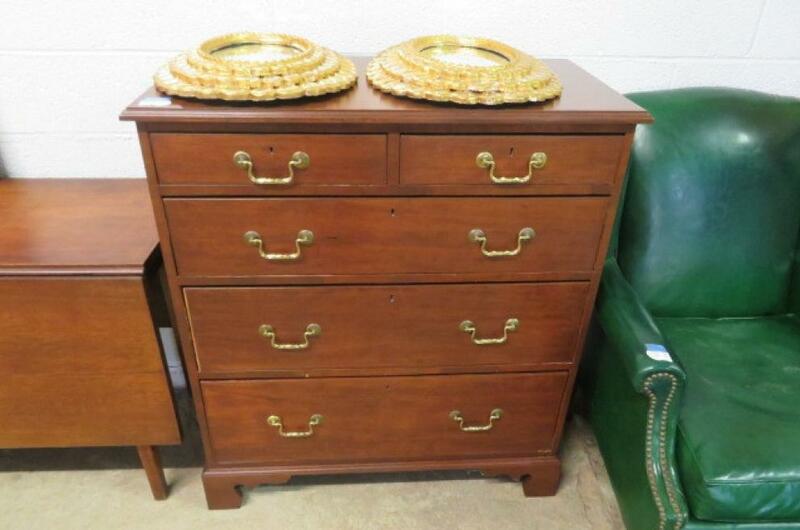 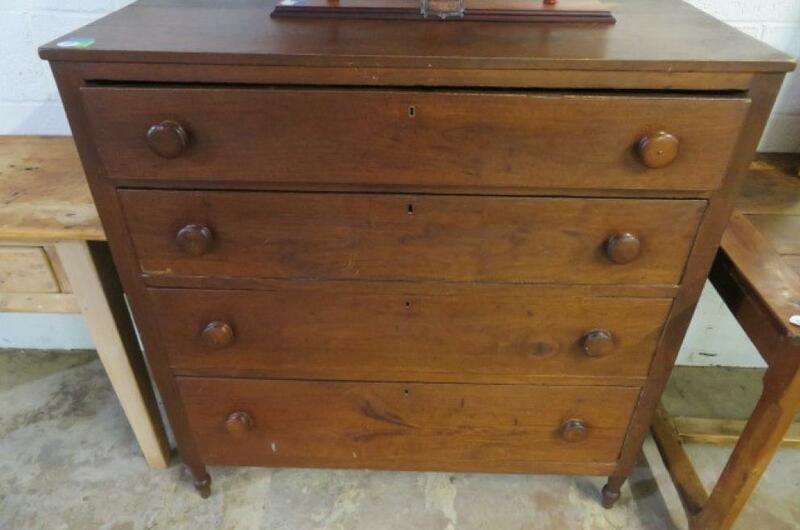 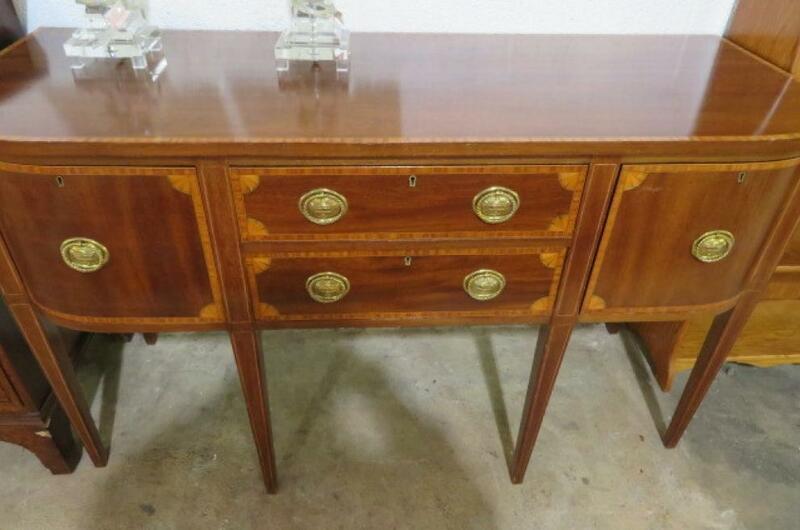 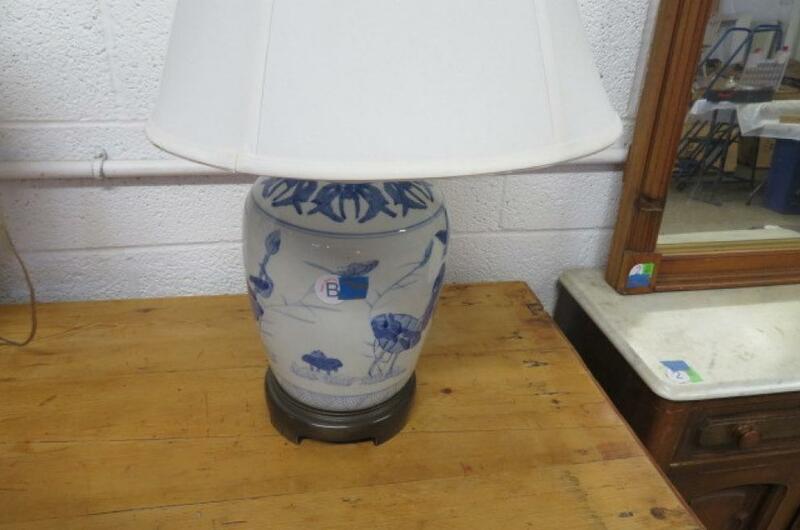 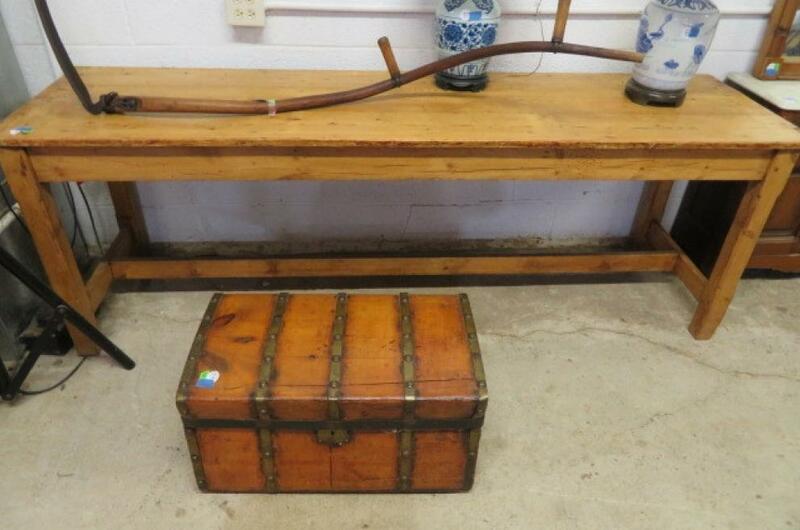 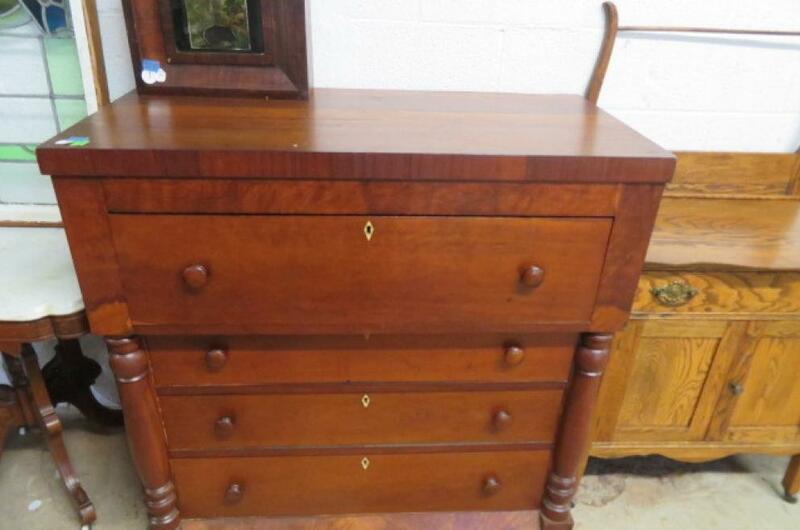 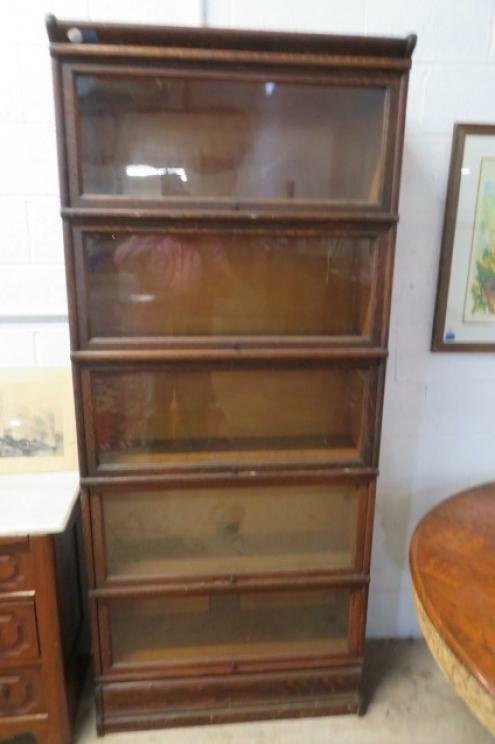 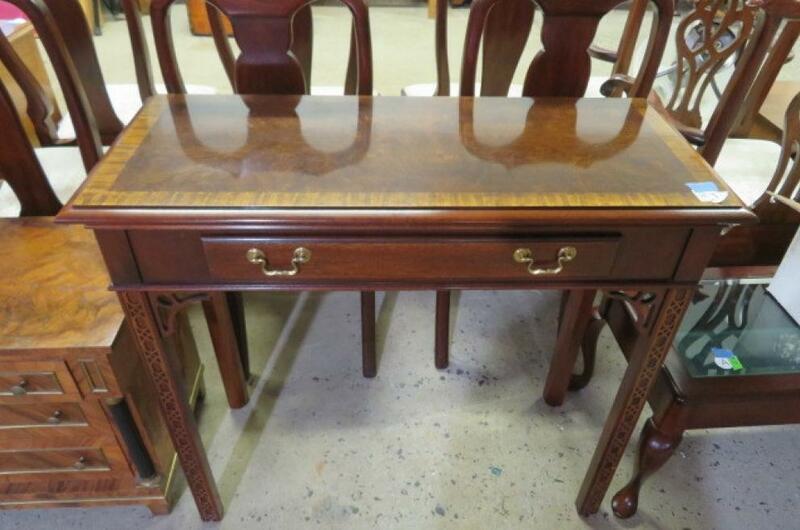 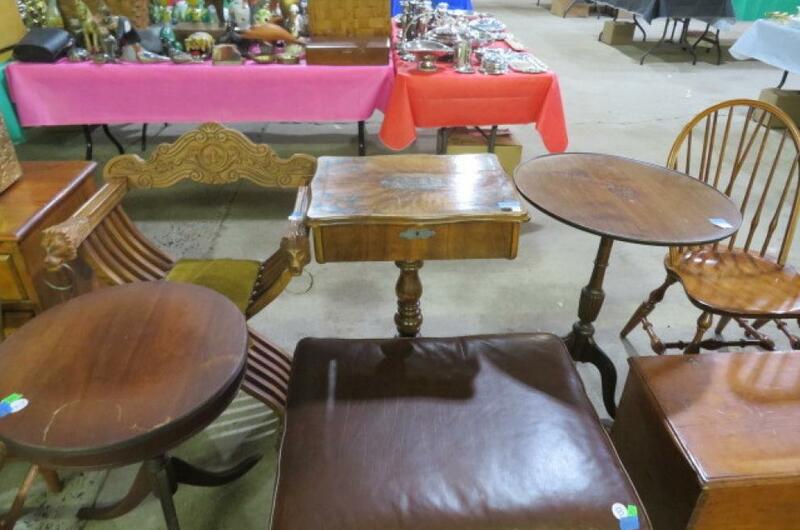 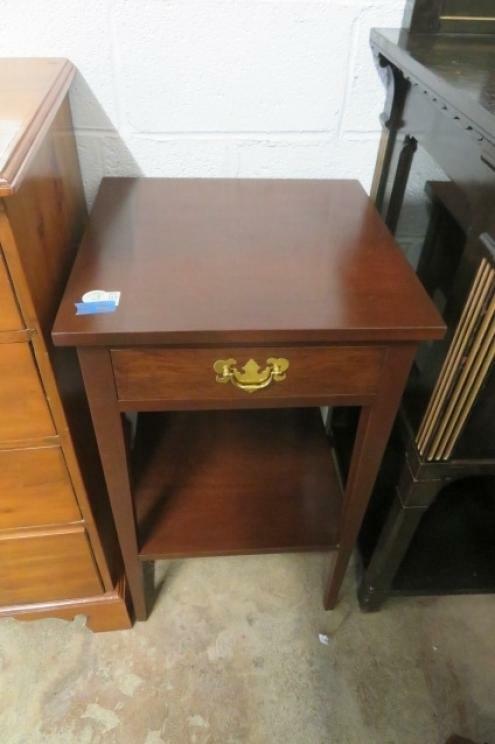 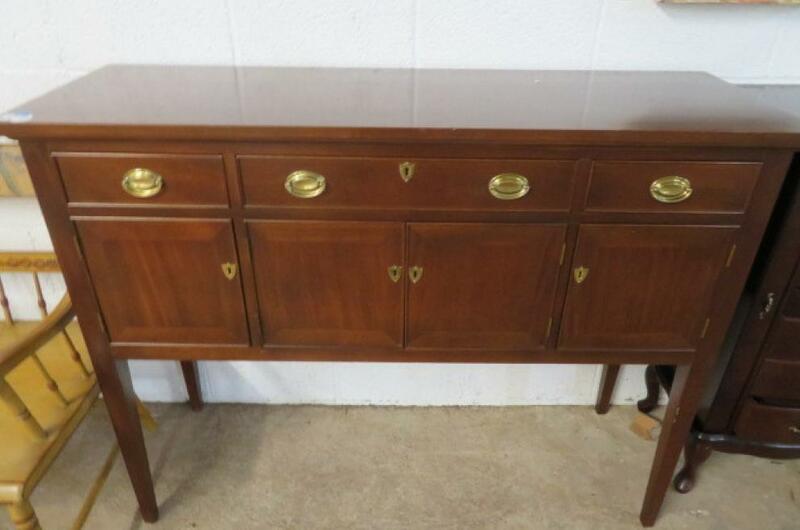 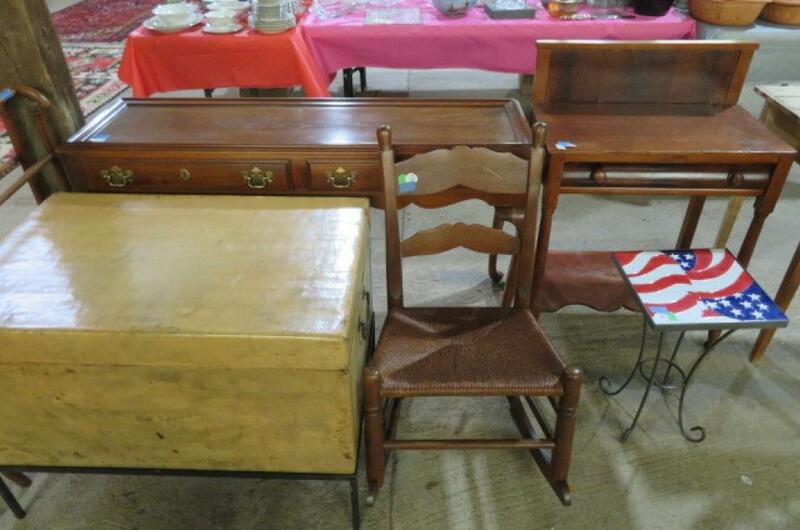 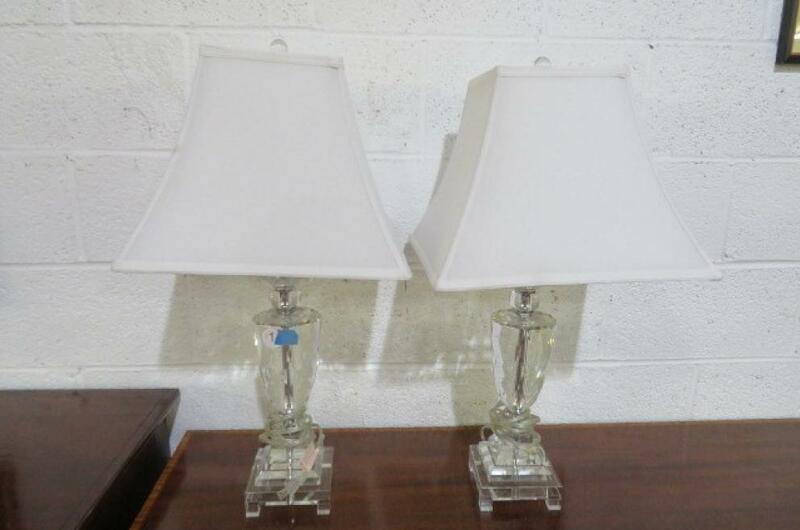 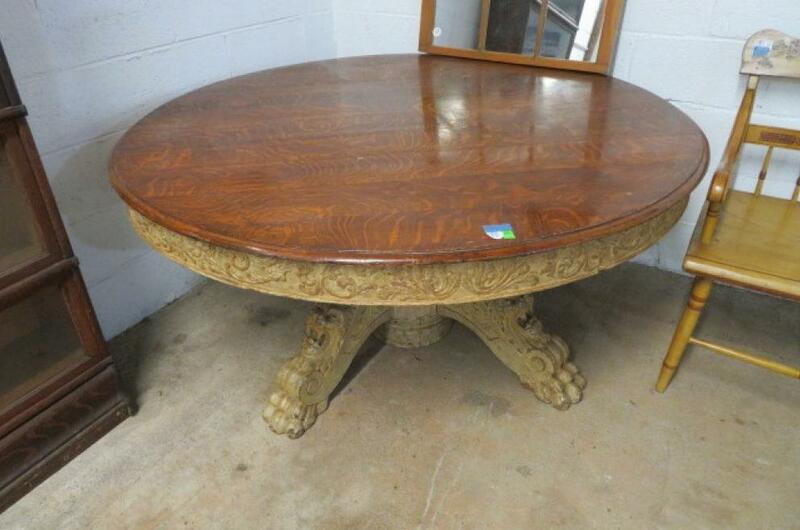 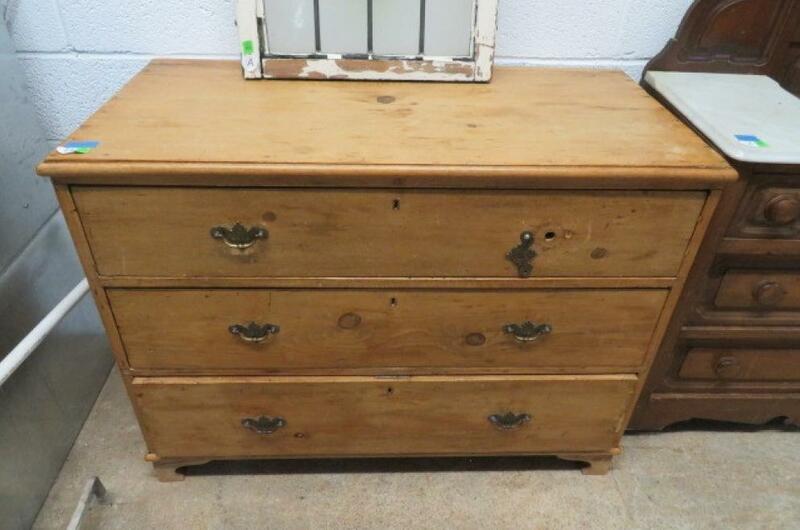 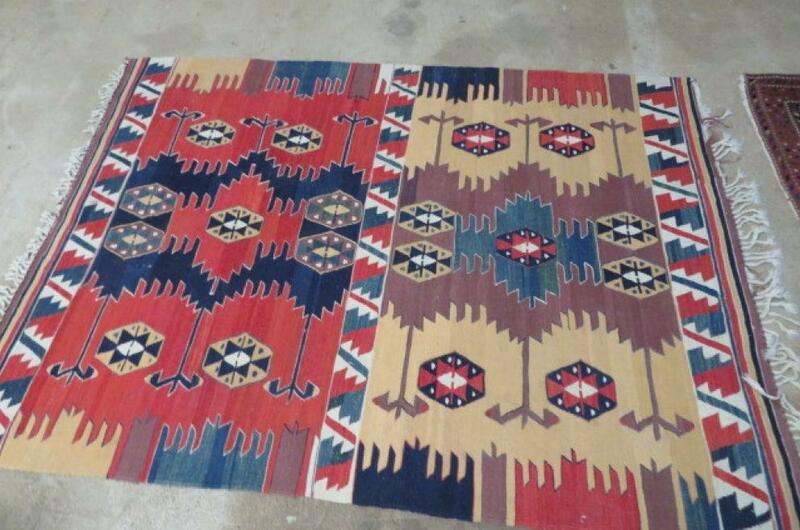 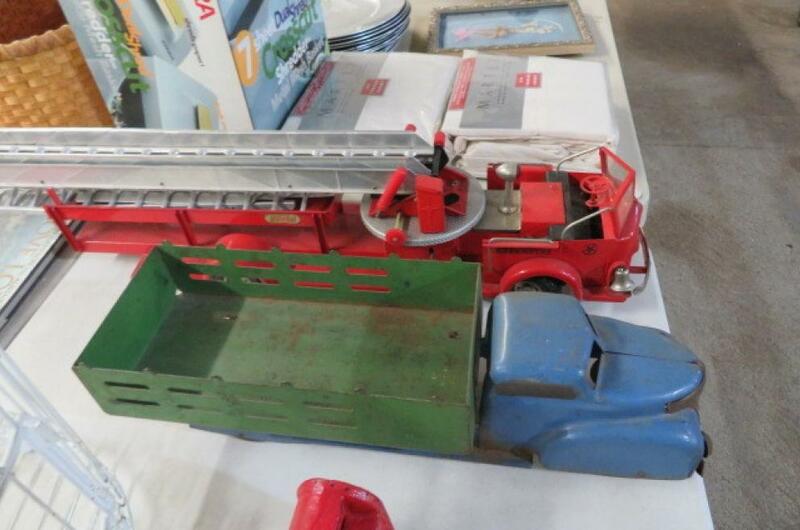 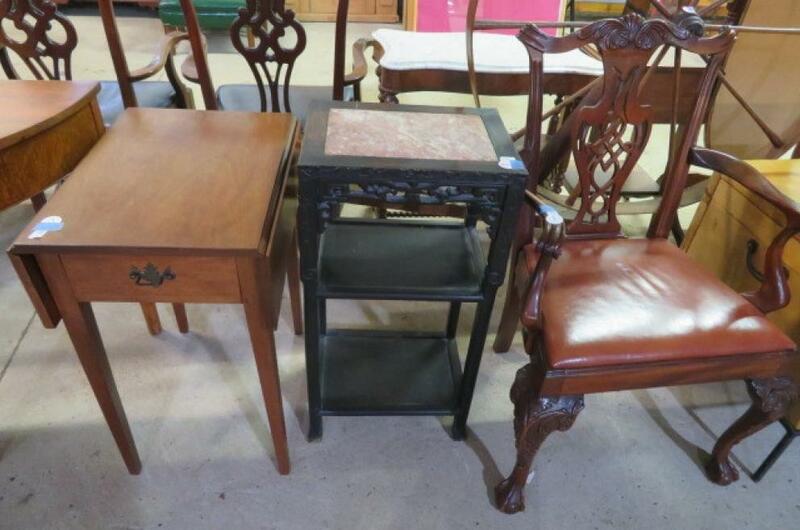 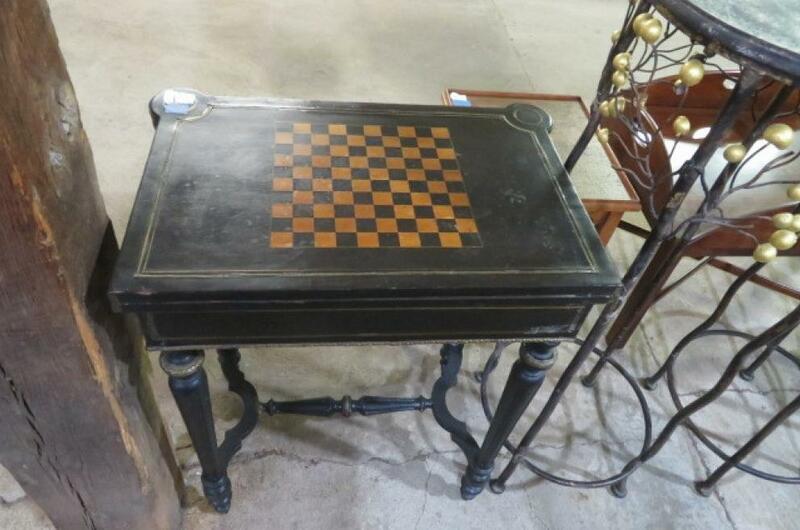 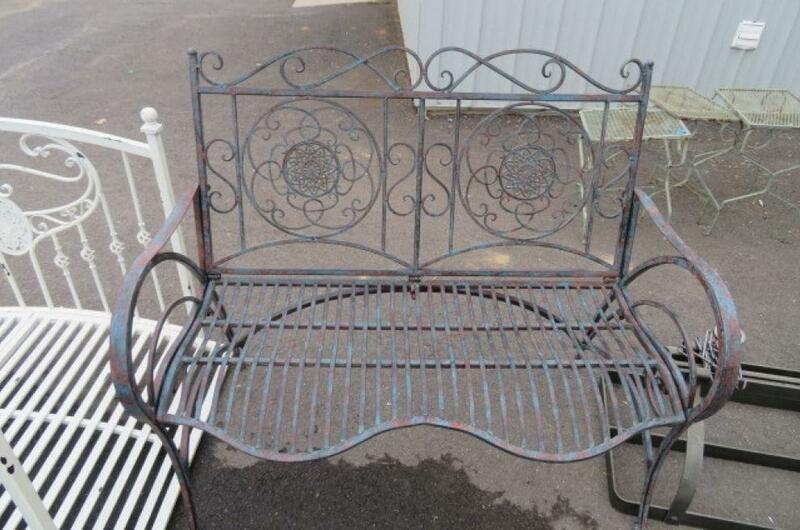 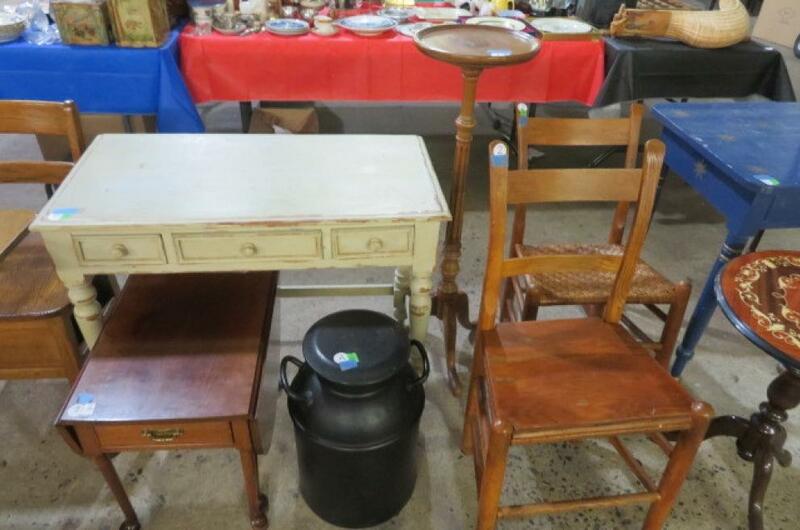 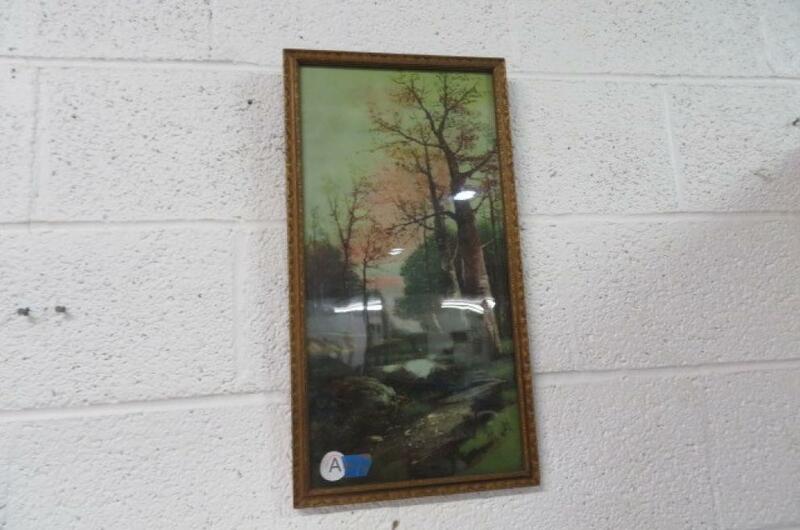 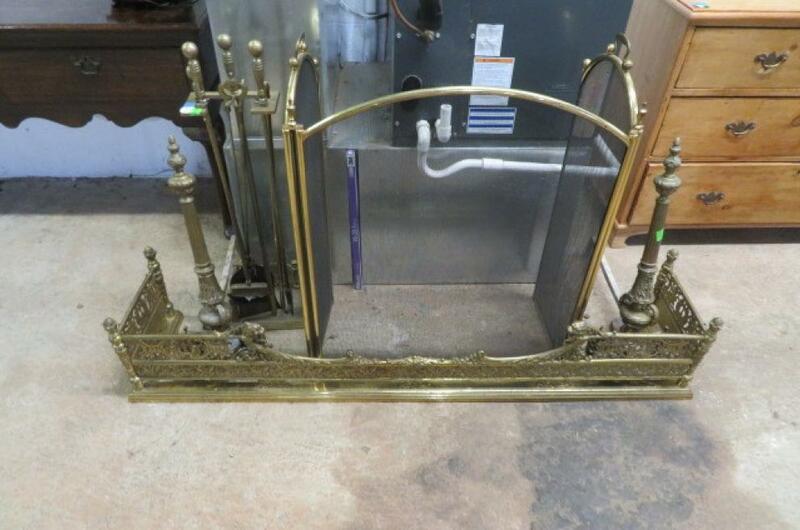 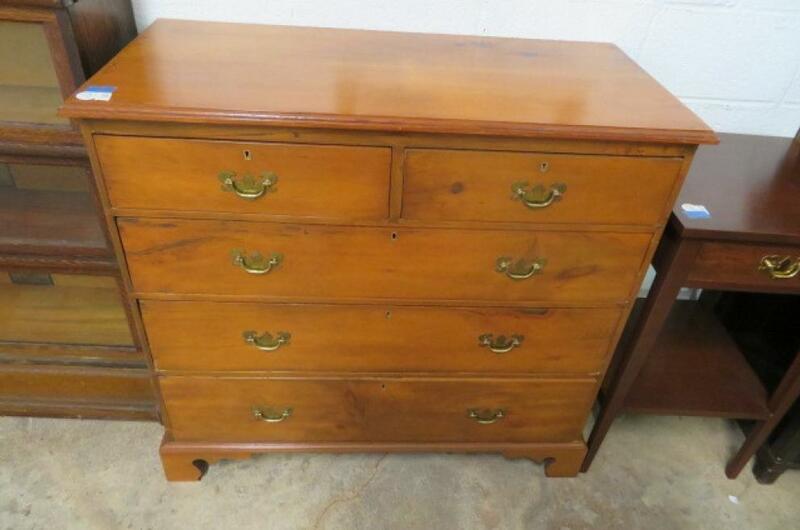 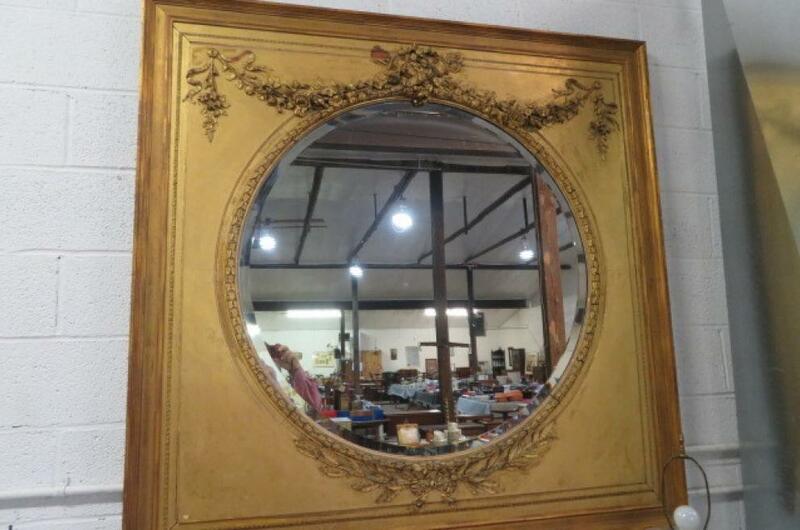 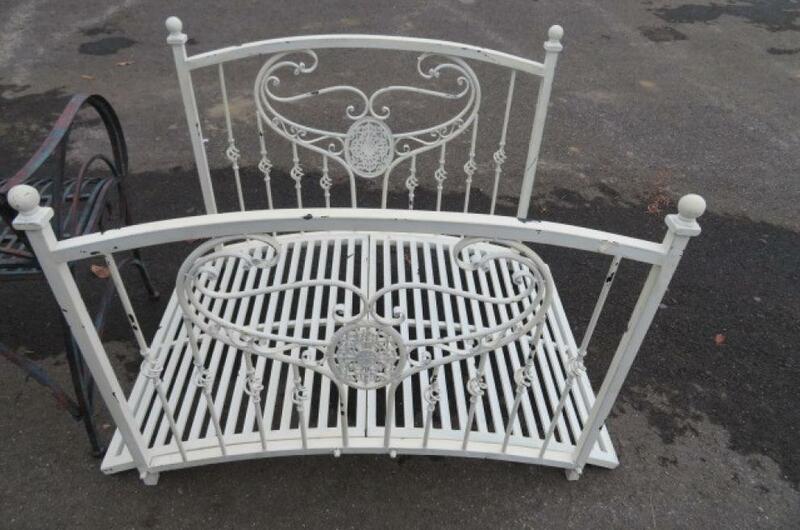 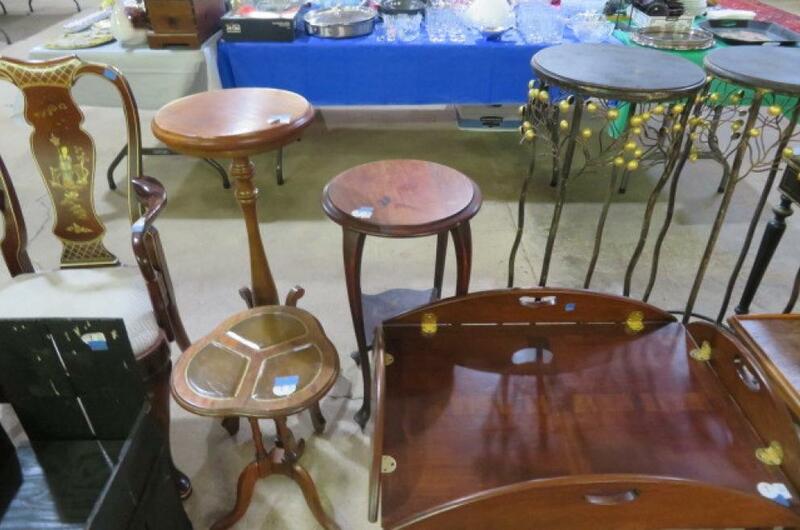 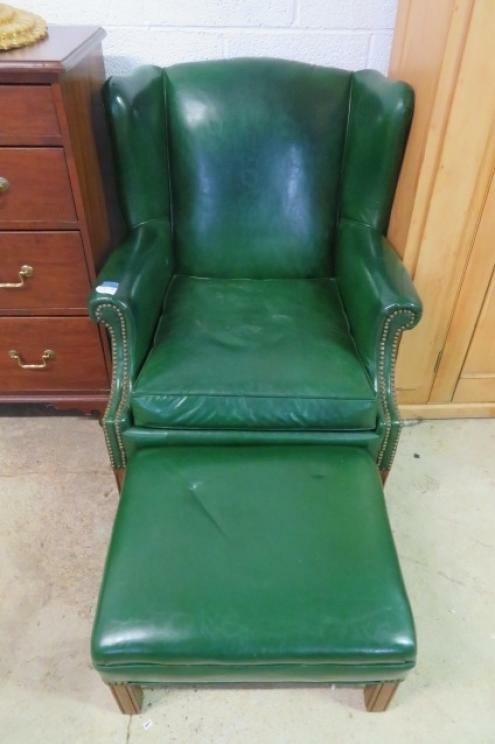 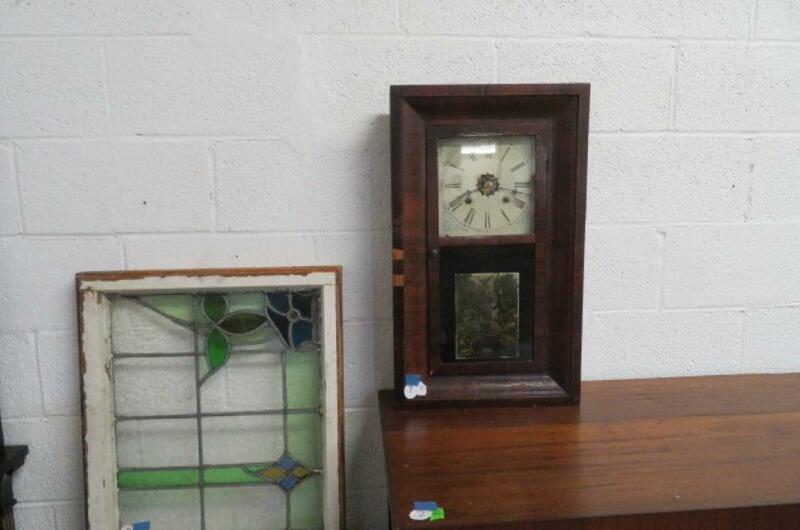 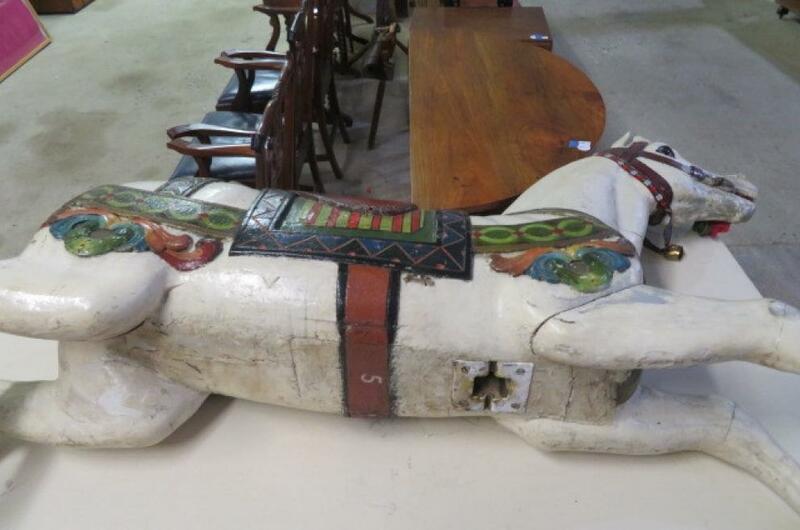 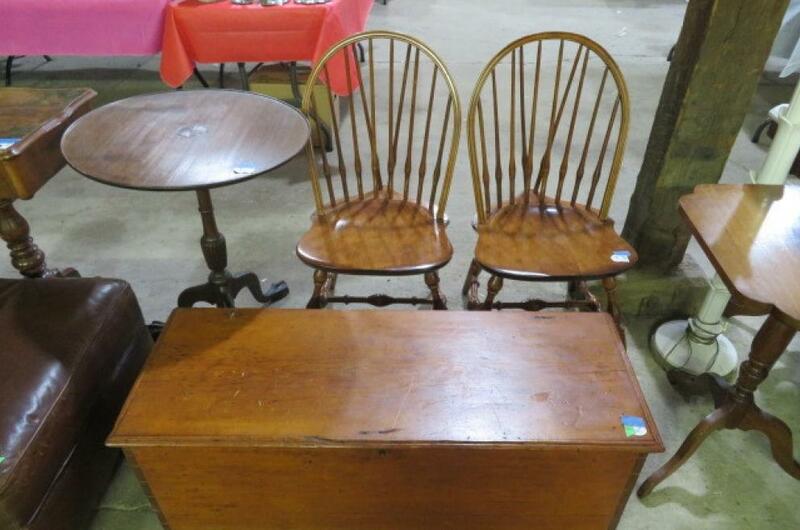 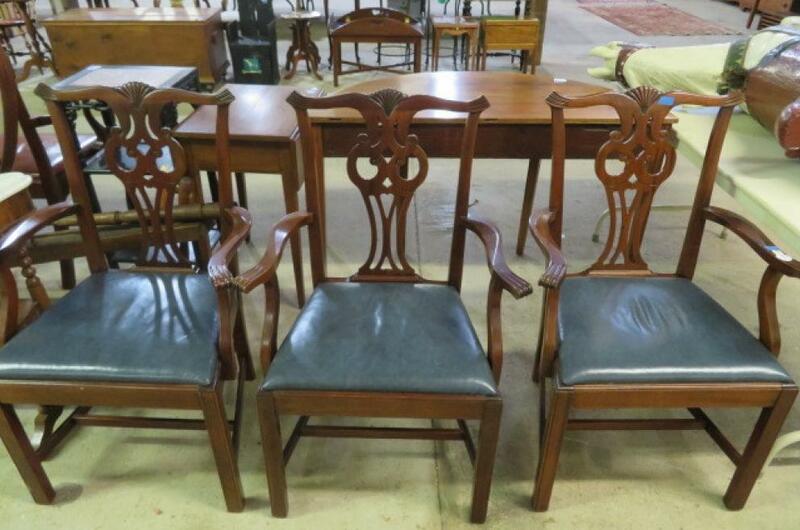 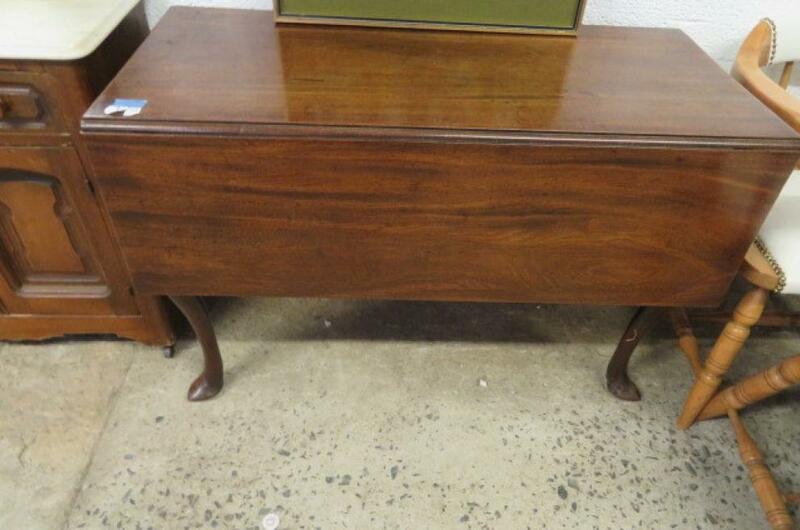 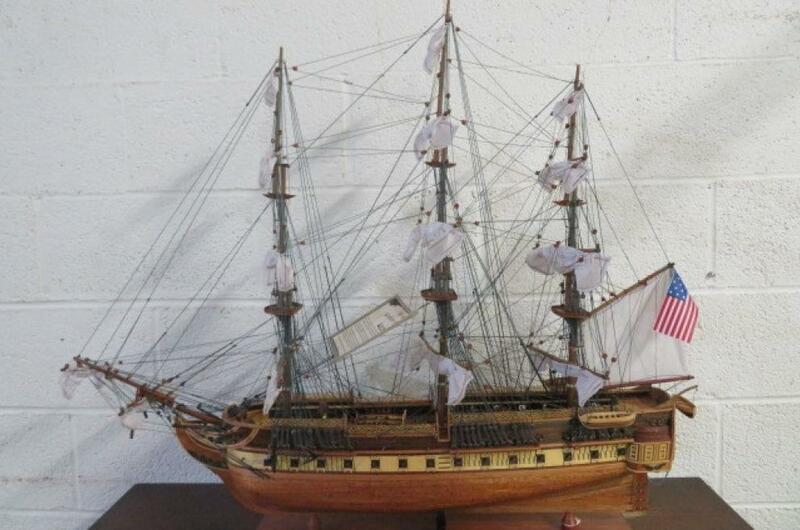 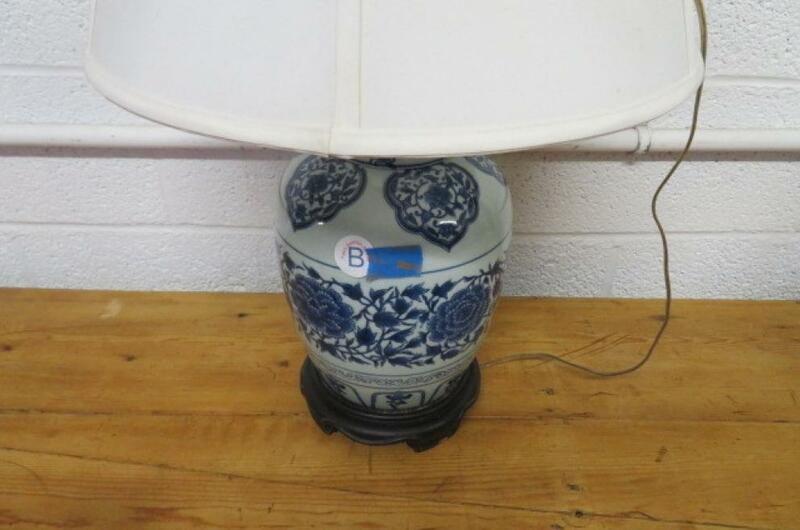 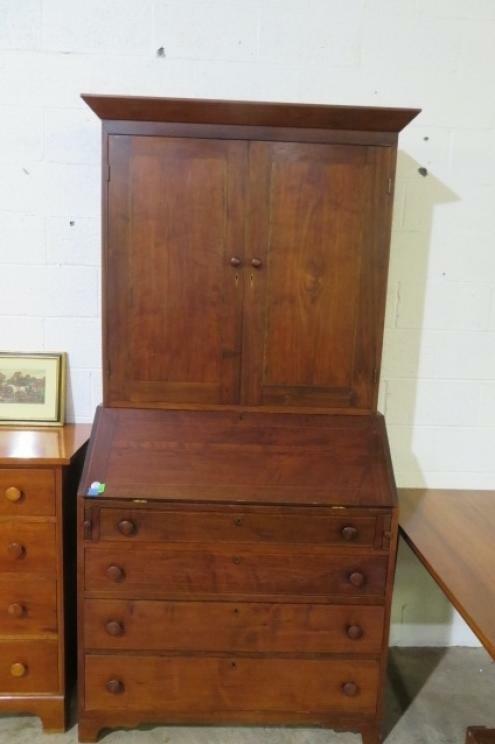 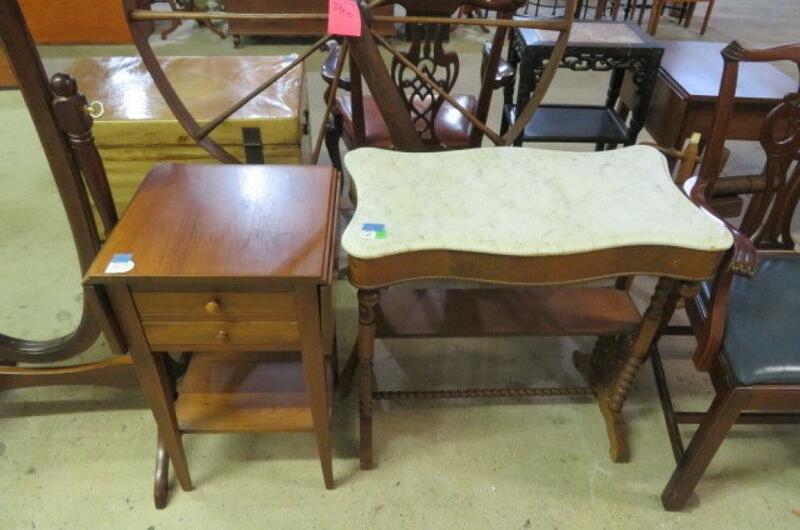 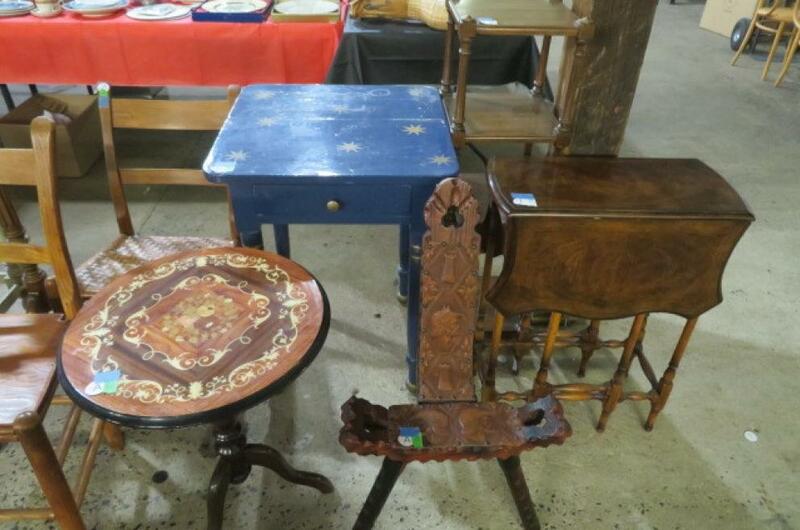 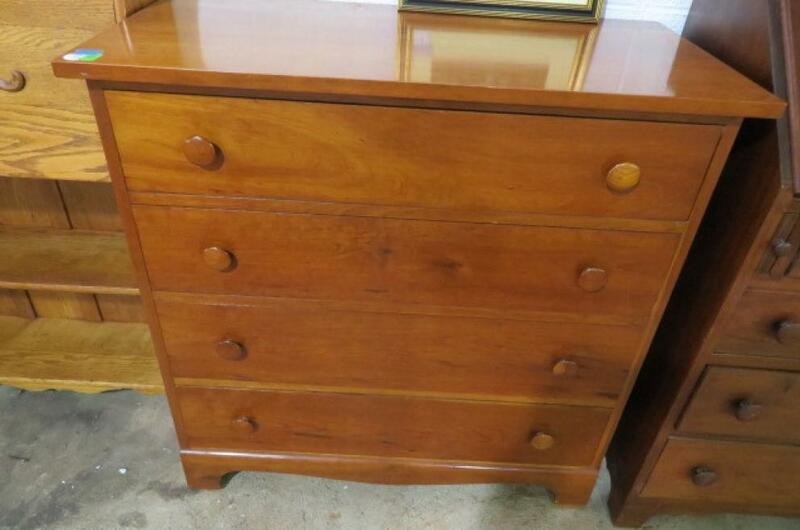 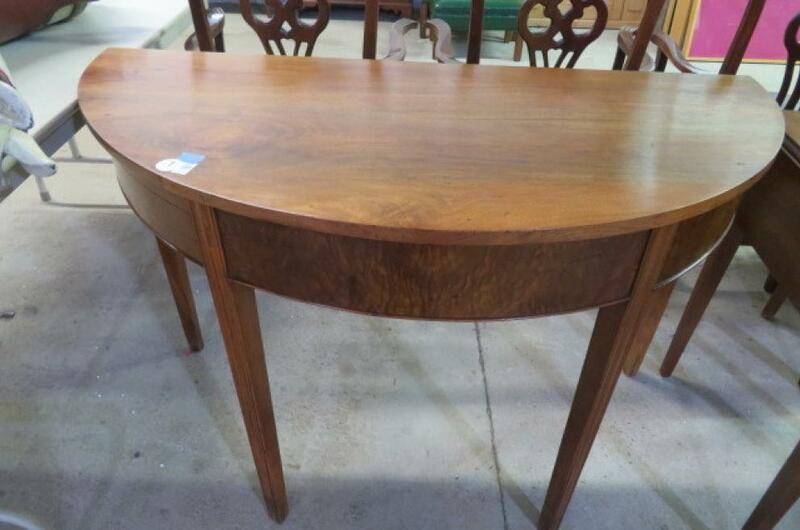 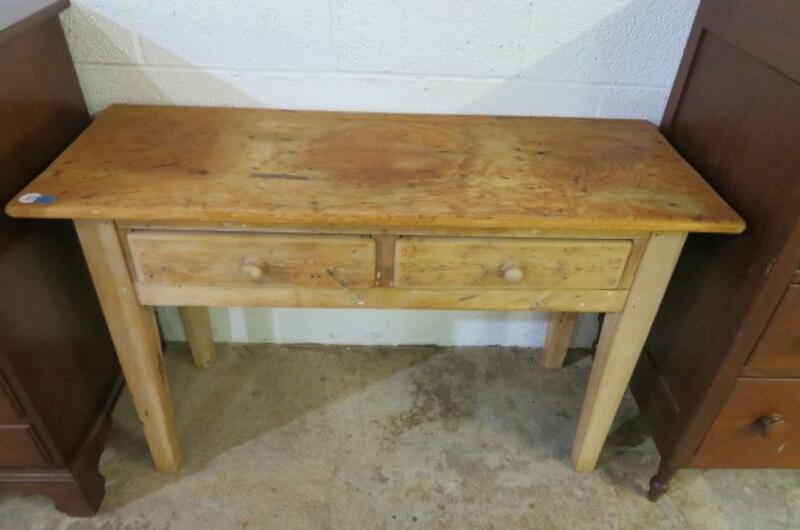 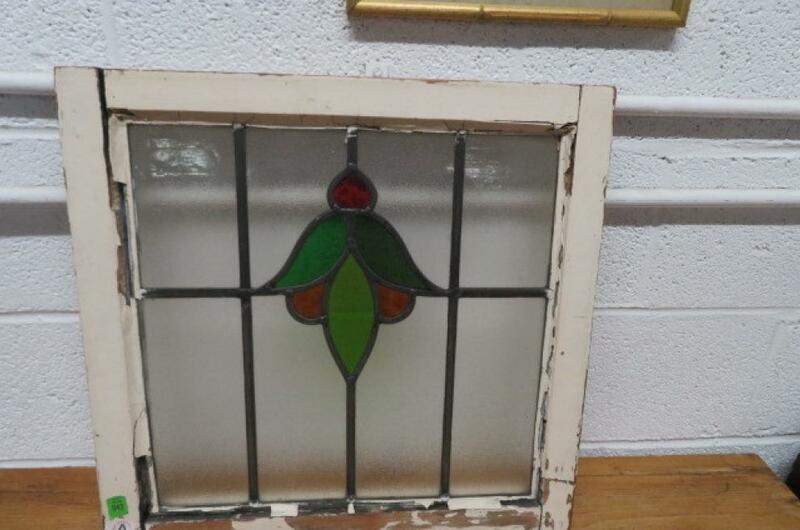 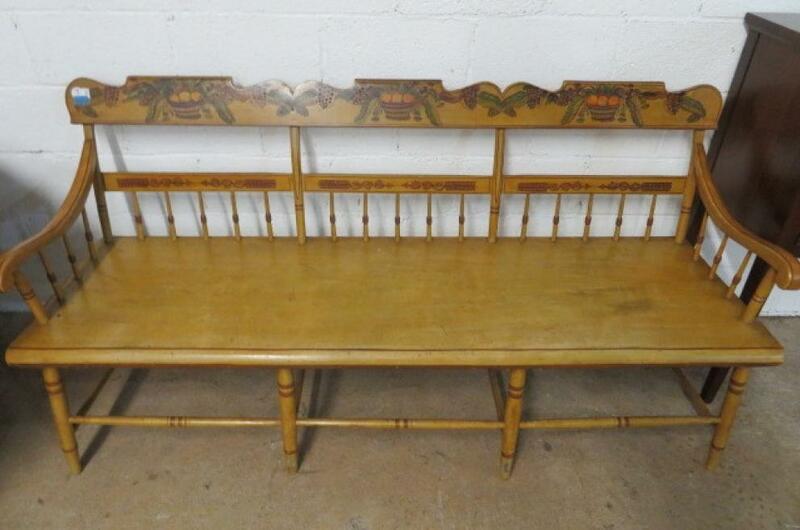 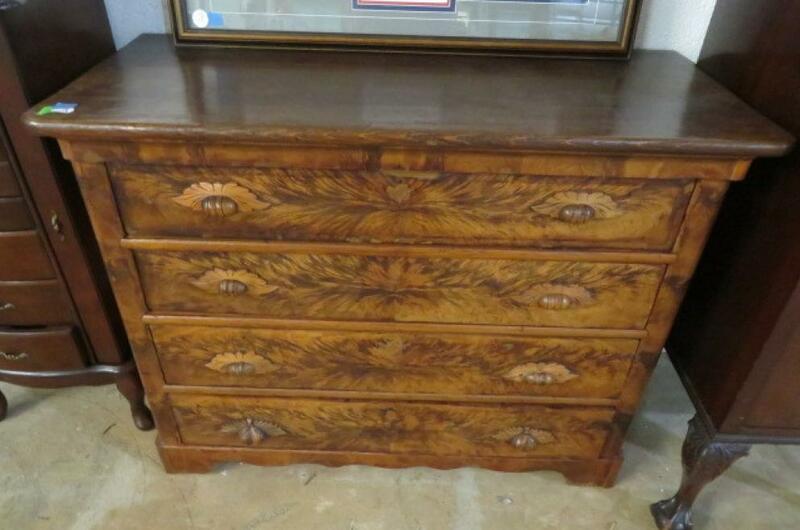 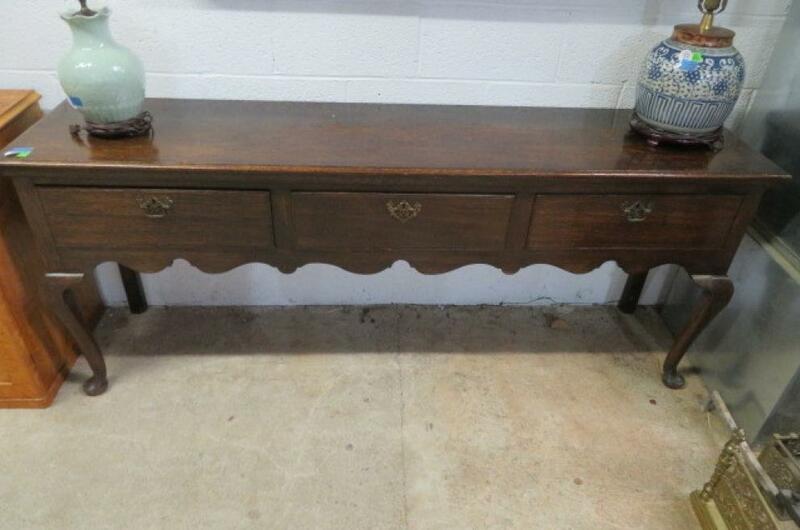 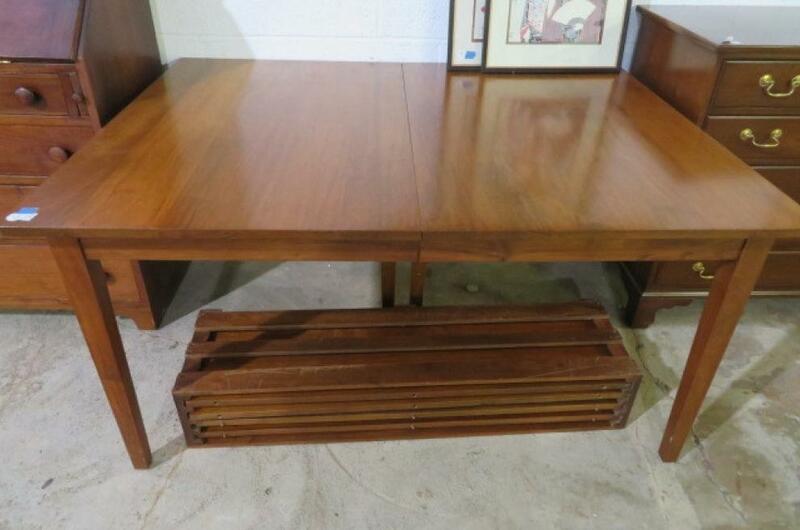 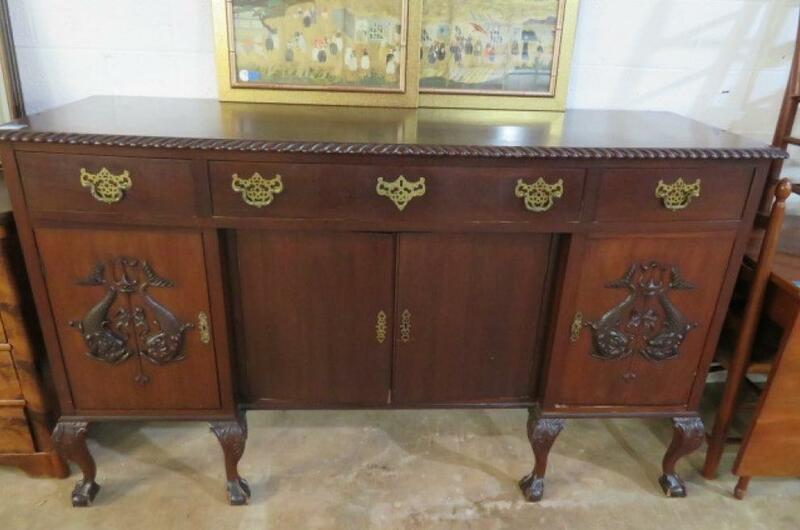 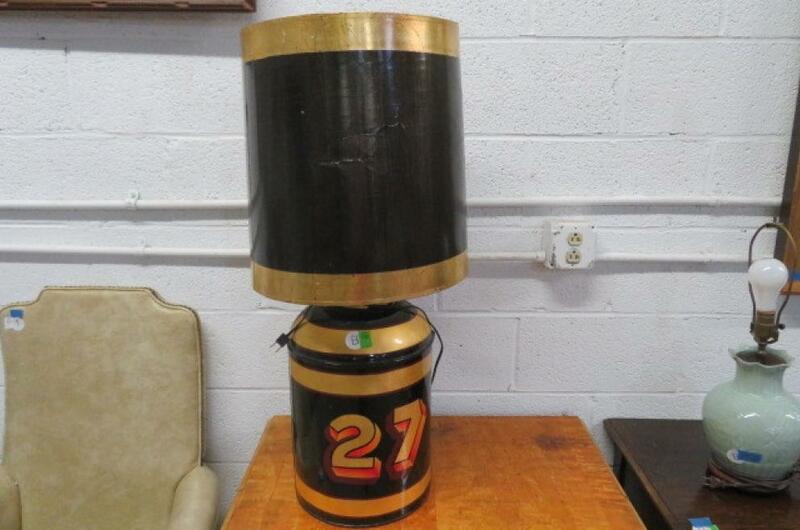 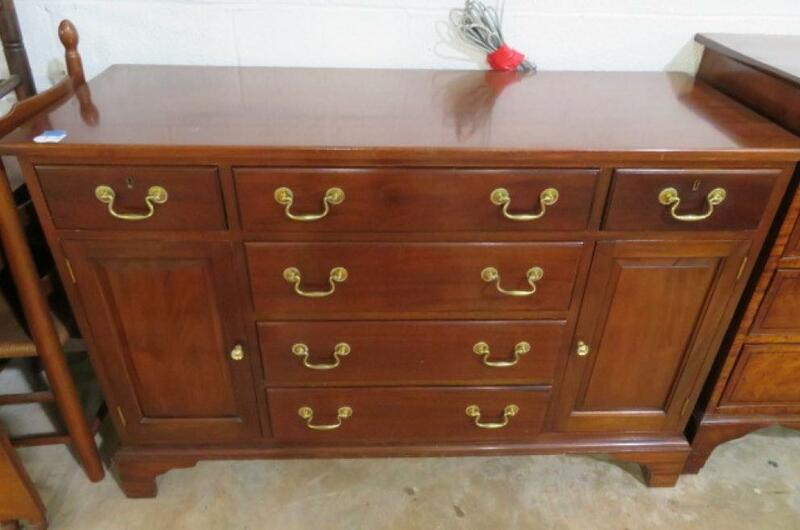 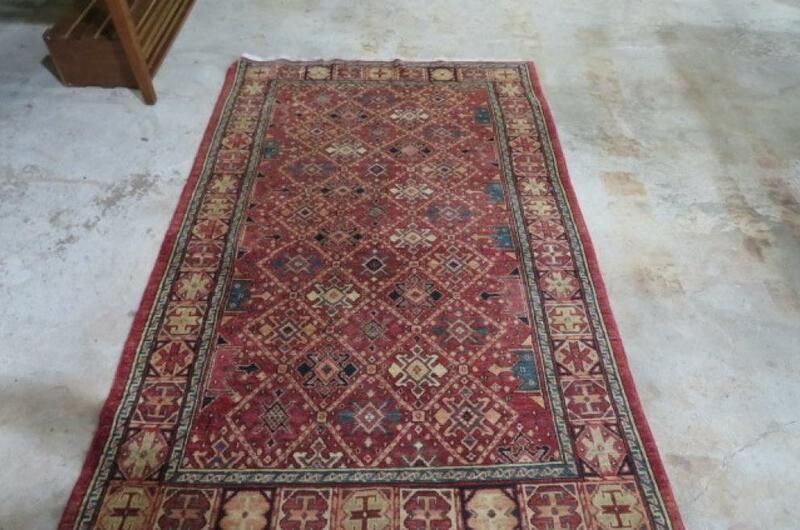 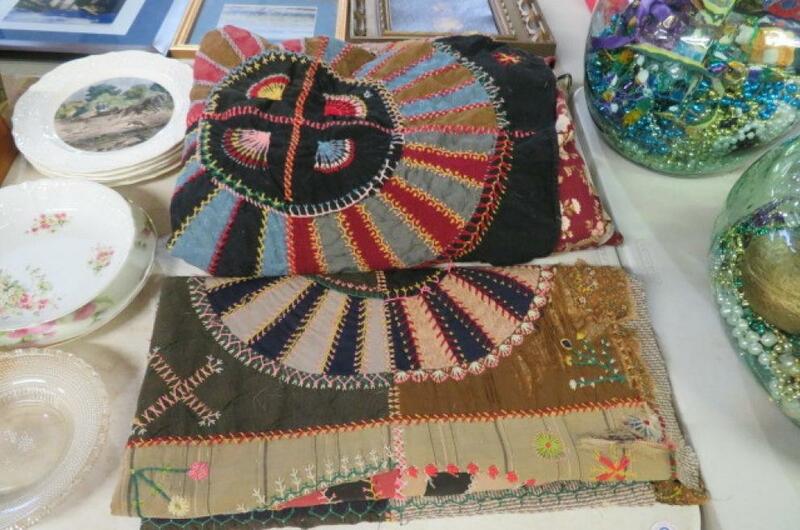 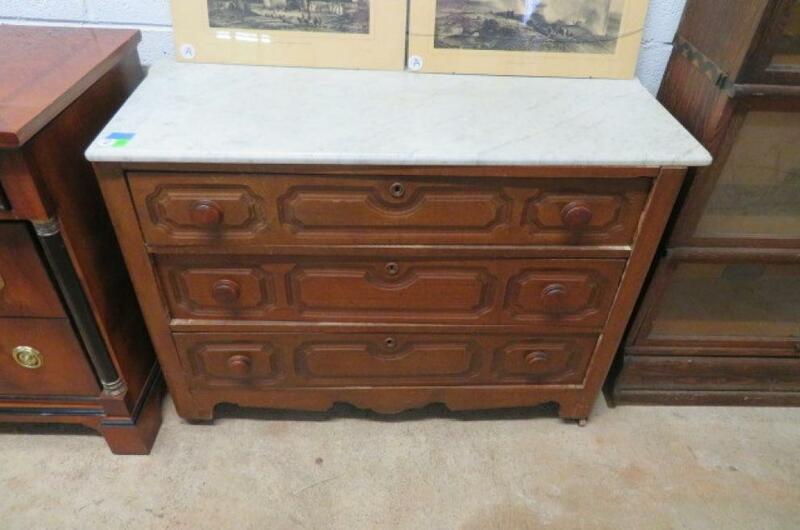 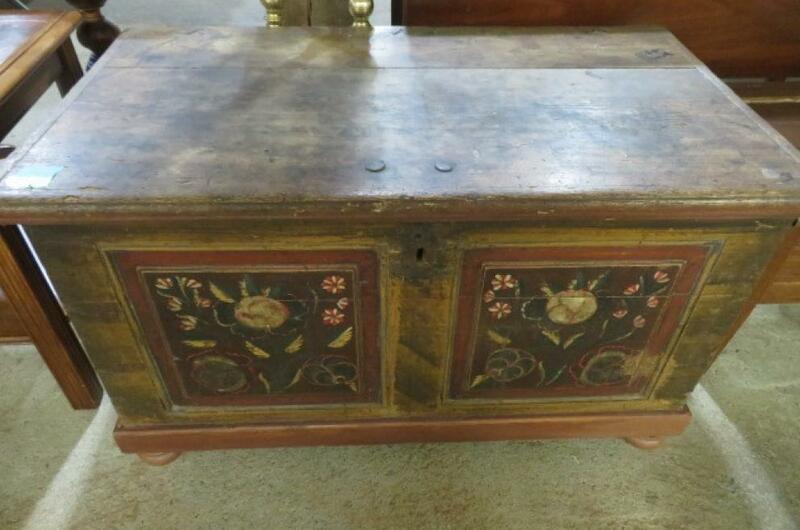 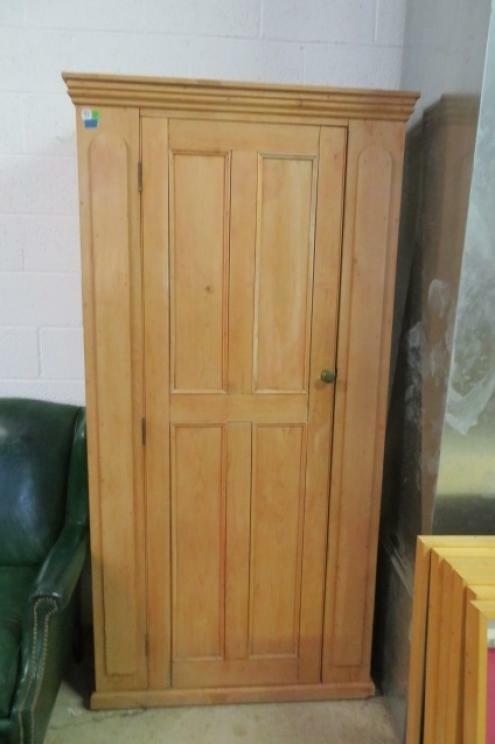 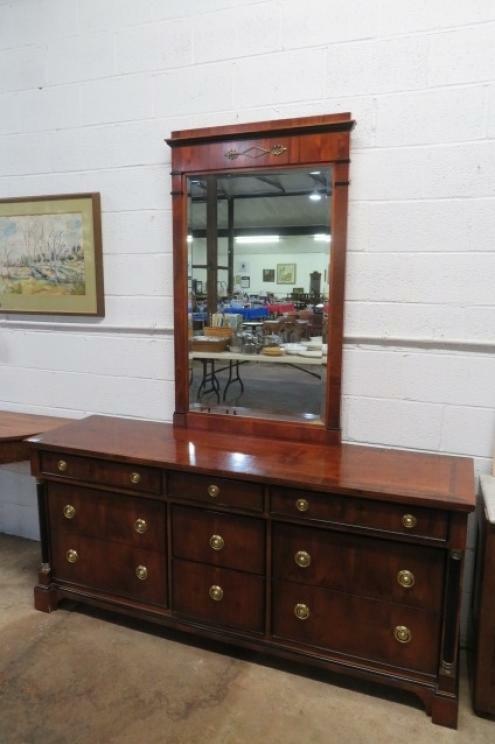 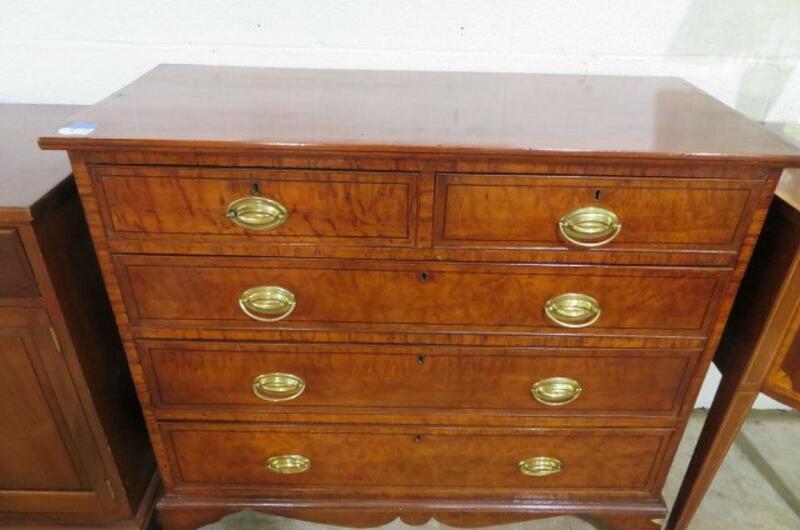 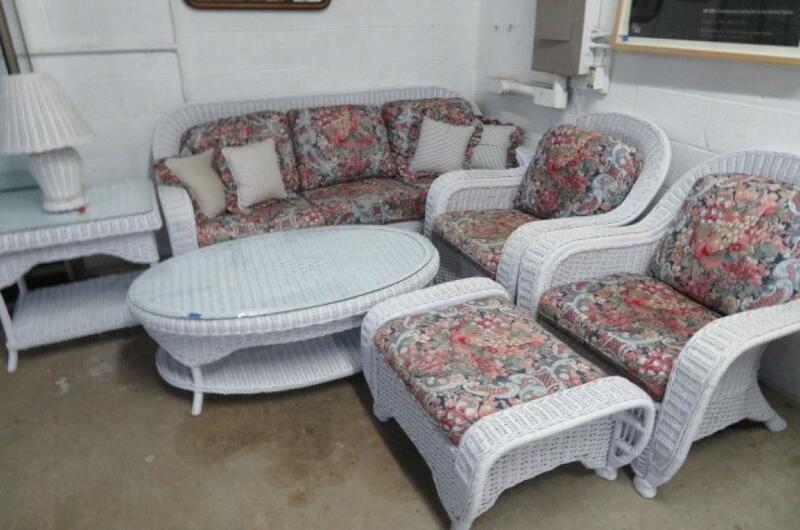 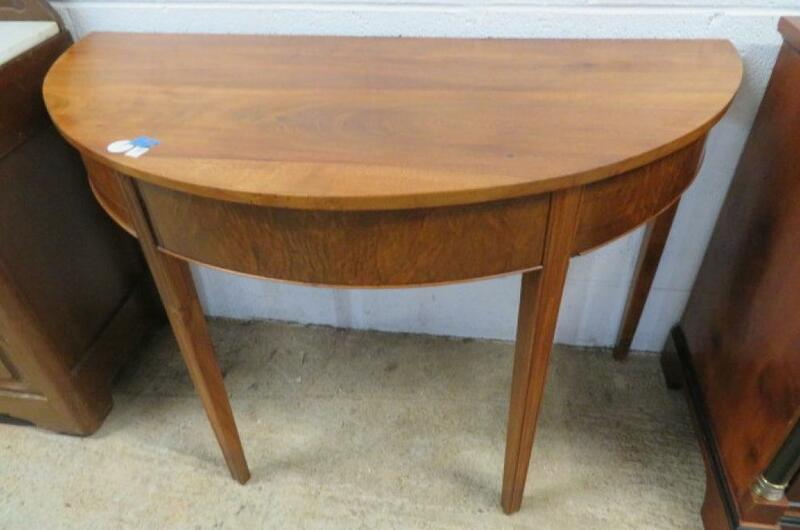 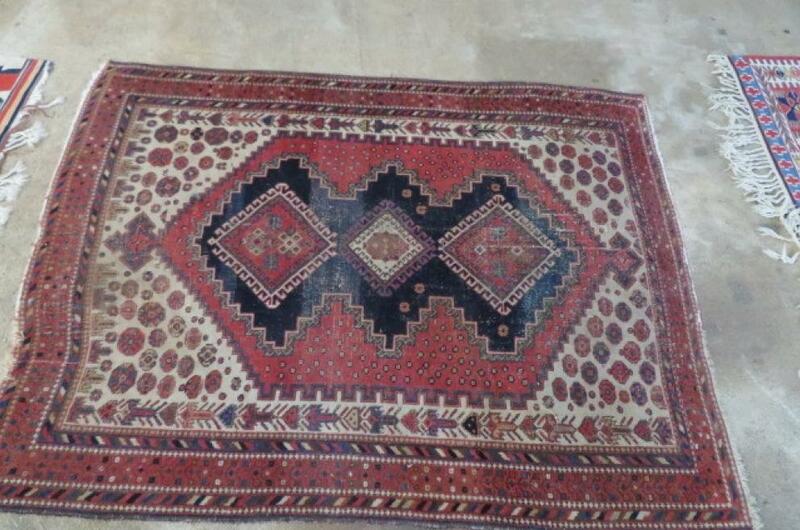 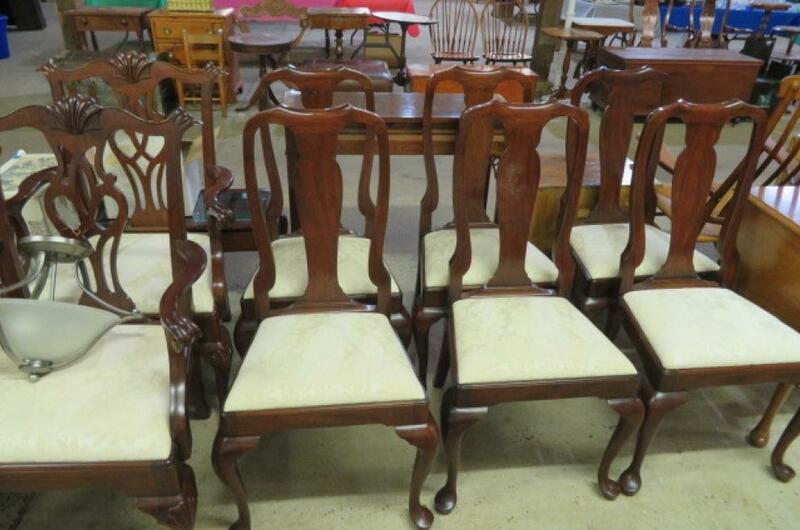 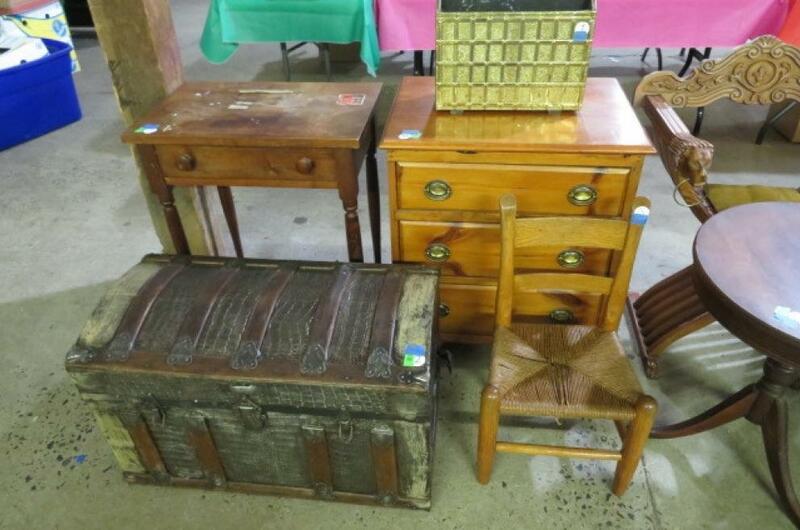 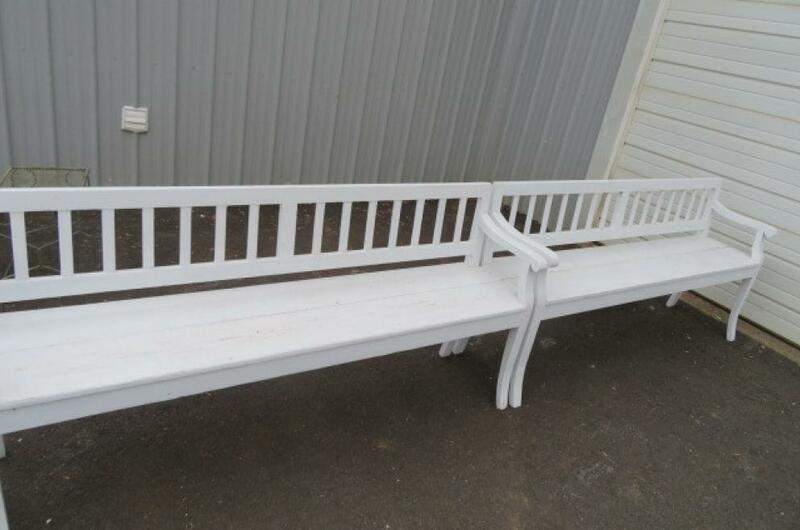 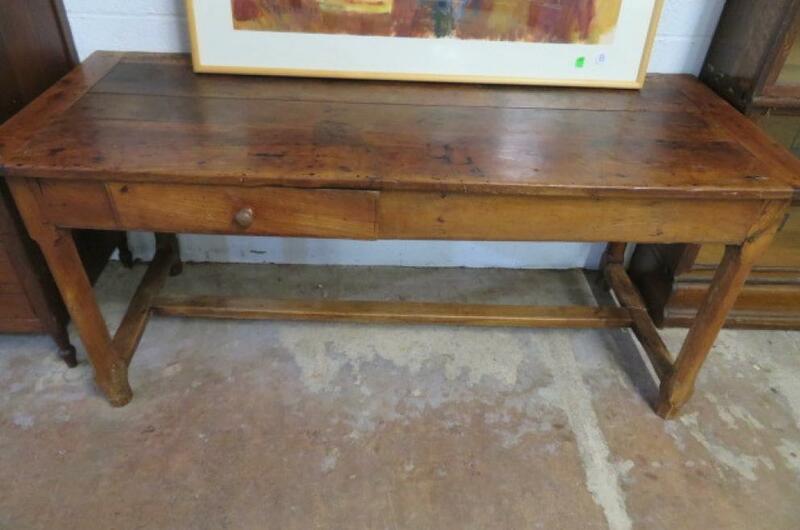 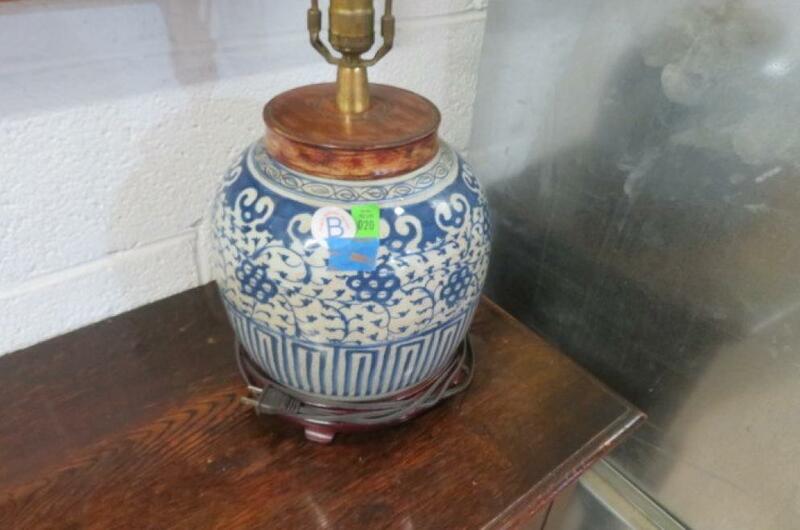 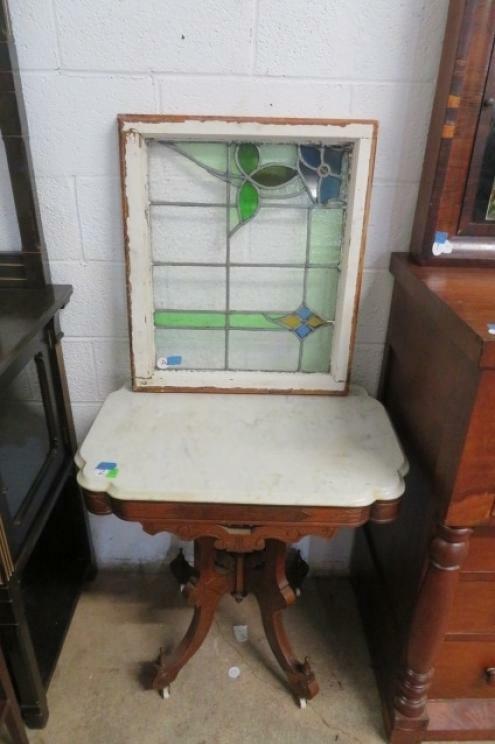 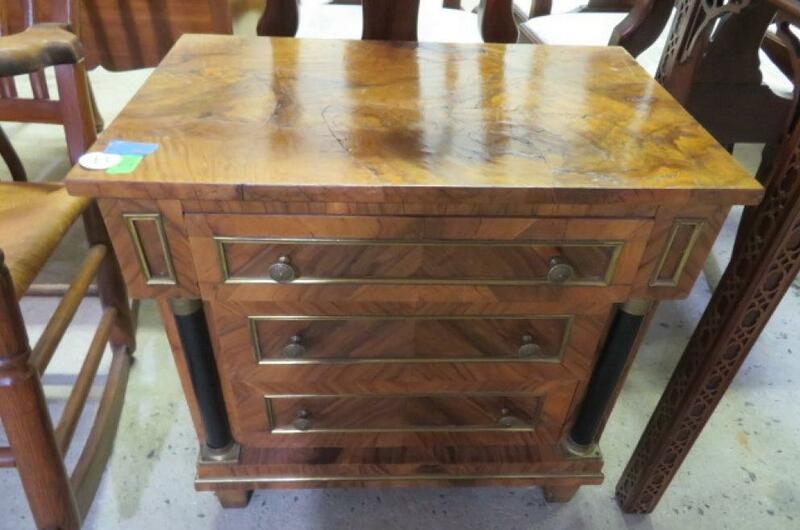 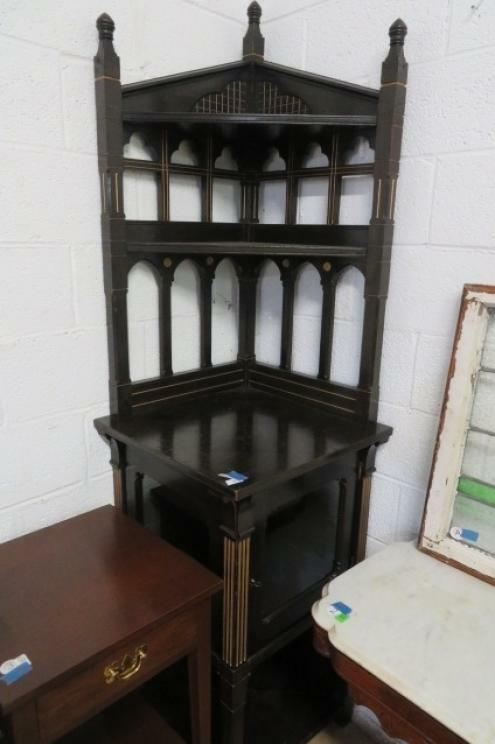 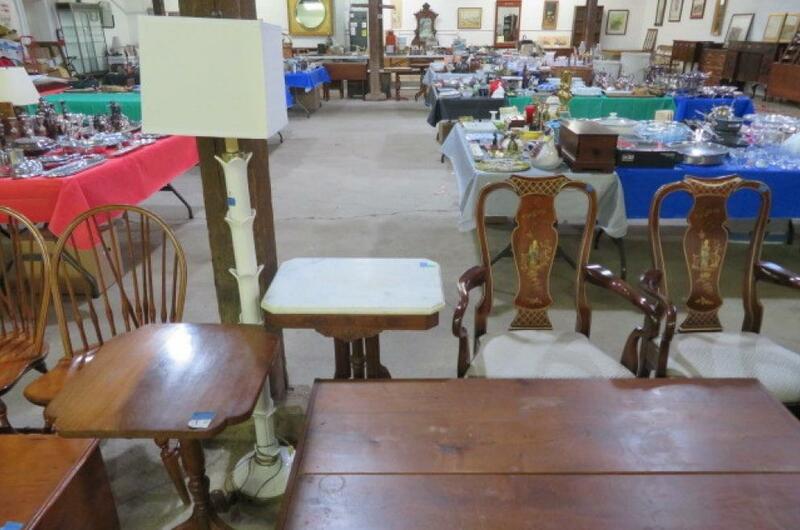 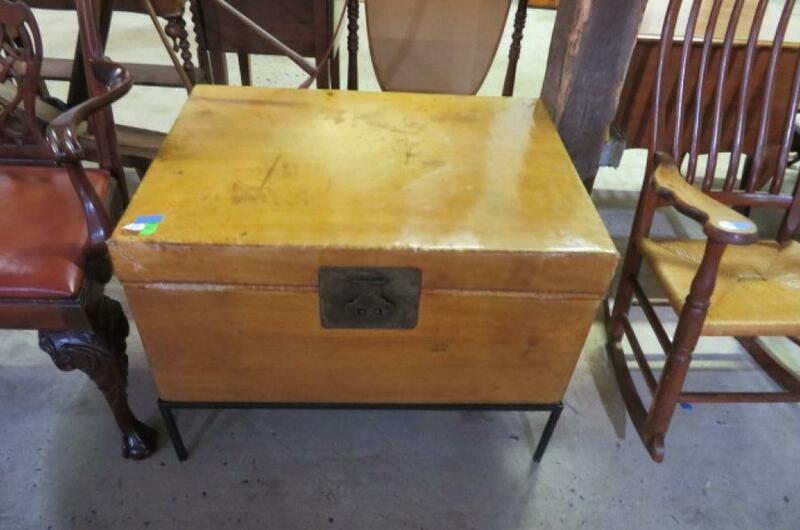 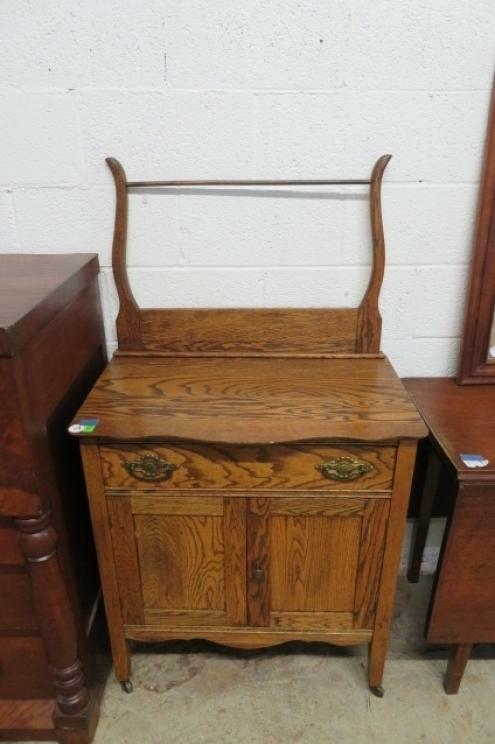 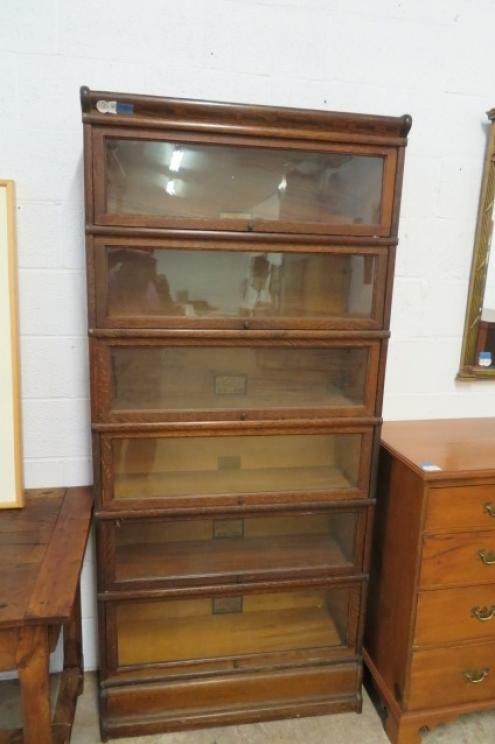 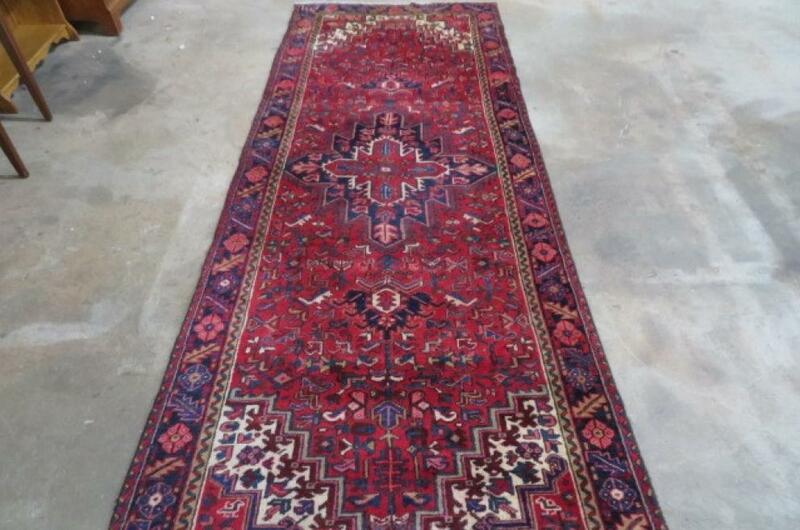 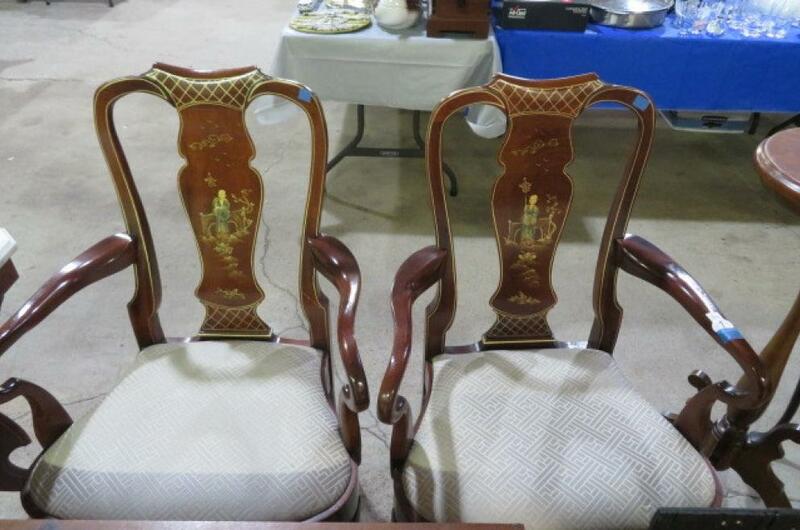 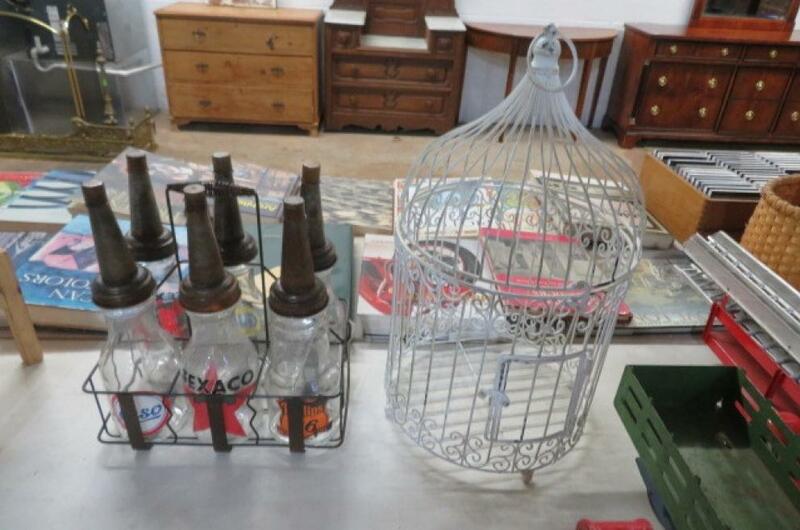 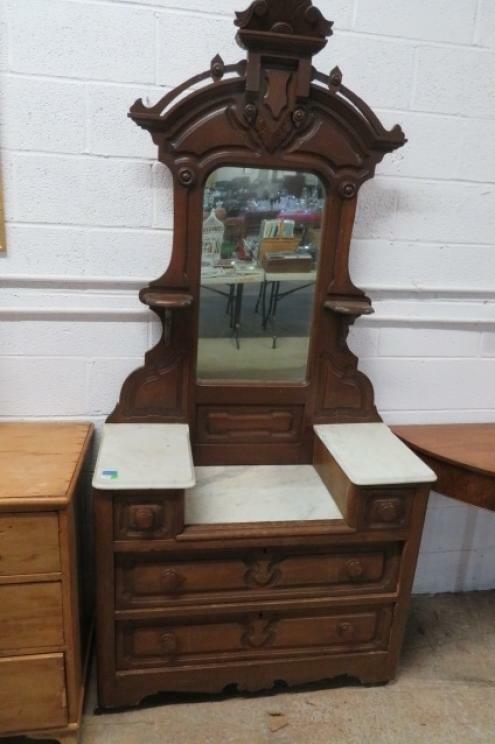 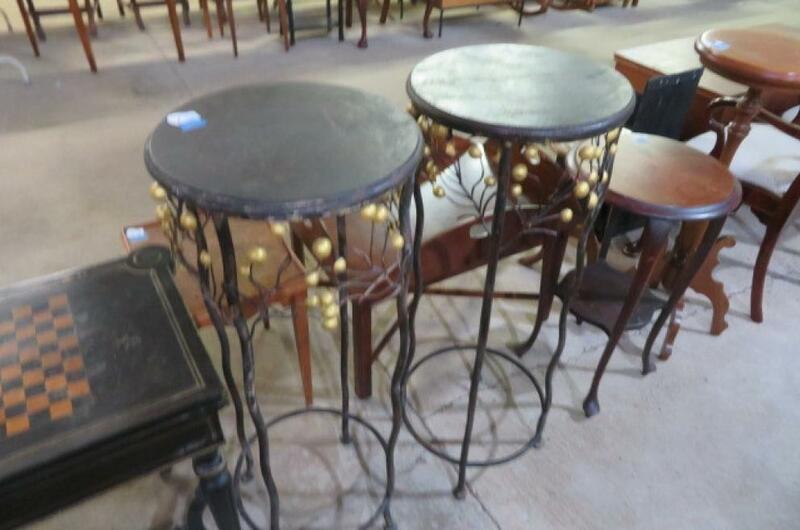 Really Great Collection of Early Furniture, Clore, Henkel Harris & More! 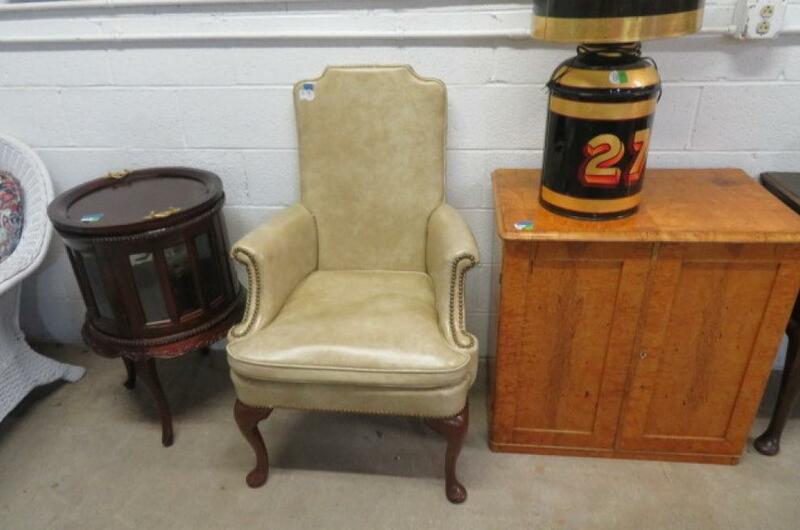 Fireplace set-Tools & holder, Andirons, Fender & Screen; Hall Table; All Kinds of Lamps; Drum Display table; Leather Armchair; Small Cabinet; 7 piece White Wicker Sun Room set- Sofa, 2 Chairs & Ottoman with cushions, Glass Top Coffee & Side table and Lamp; Birthing Chair; Gateleg Table; Inlaid top table; Mule Ear Chairs; Display Shelf; Milk Can; End Tables; Quilt Rack; Good Oriental and Native American Rugs & Runners; Crystal Lamps; Clocks; Brass Lamp; Sconces and Much, much More! 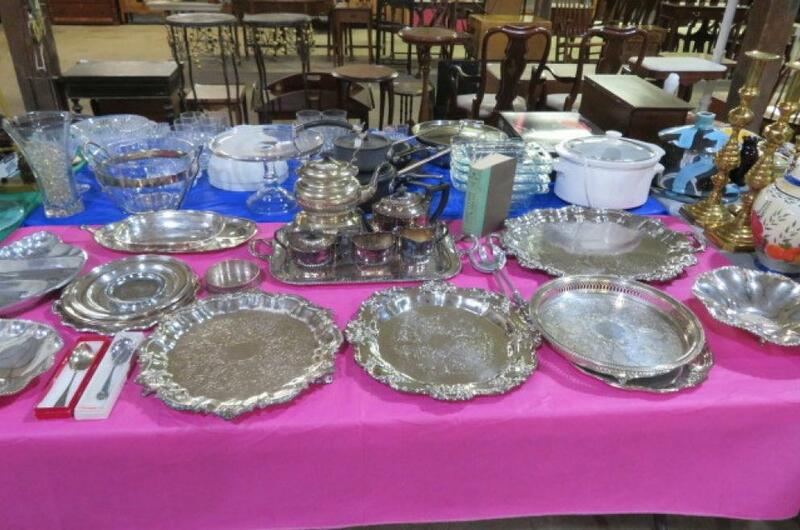 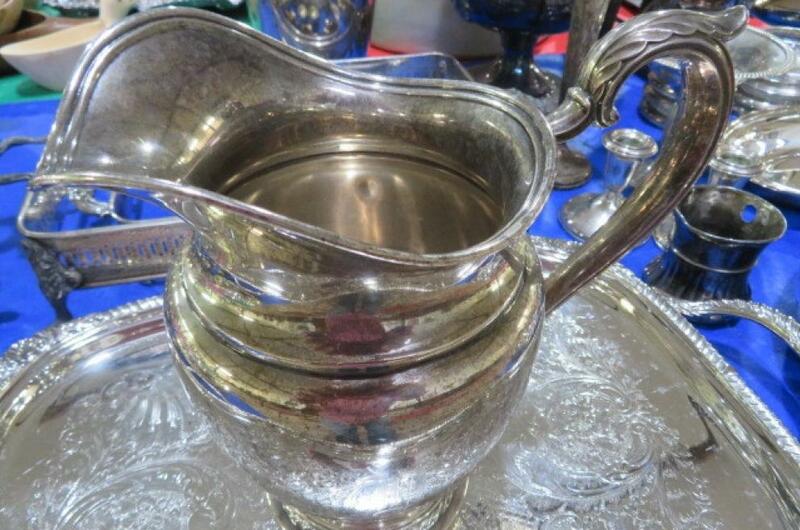 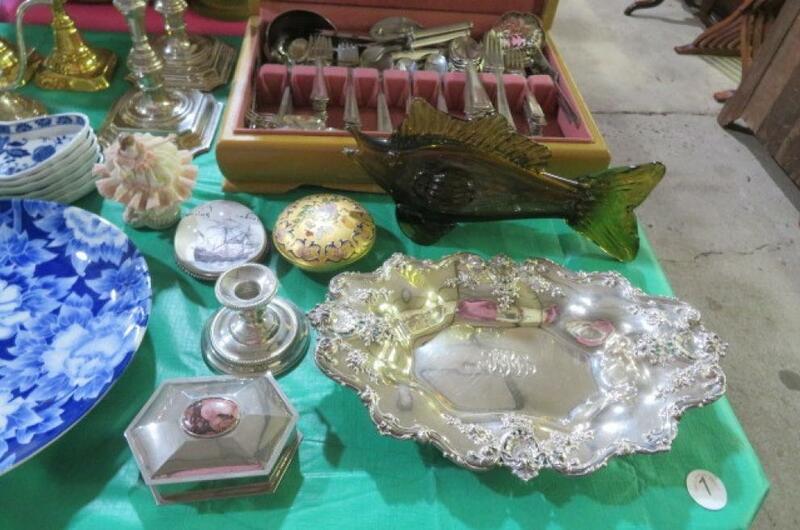 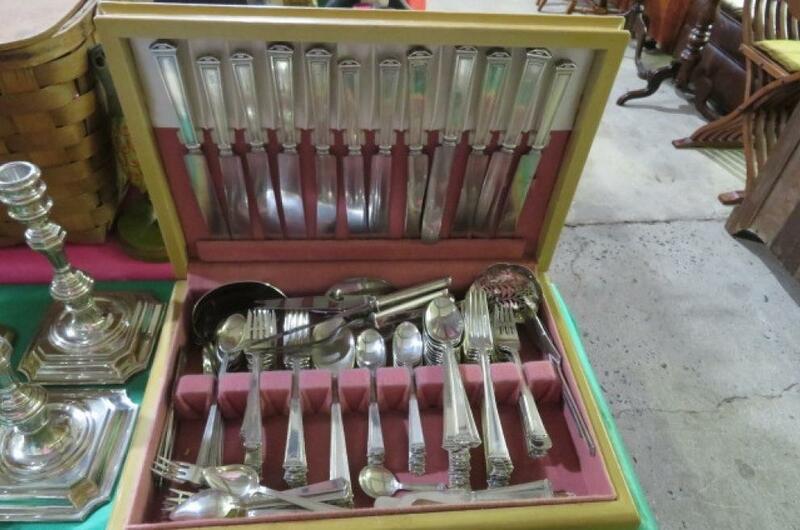 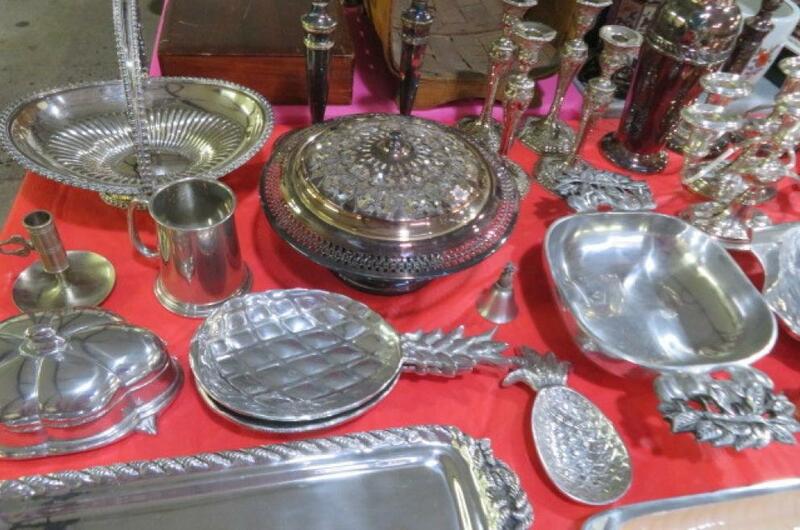 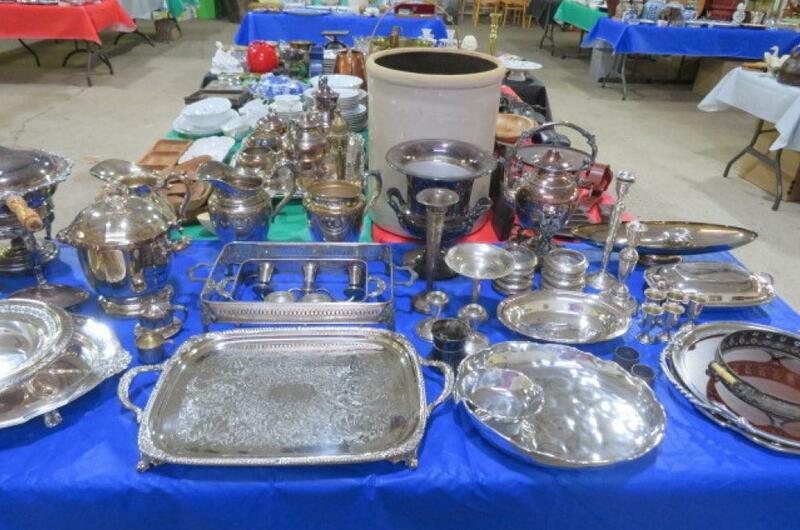 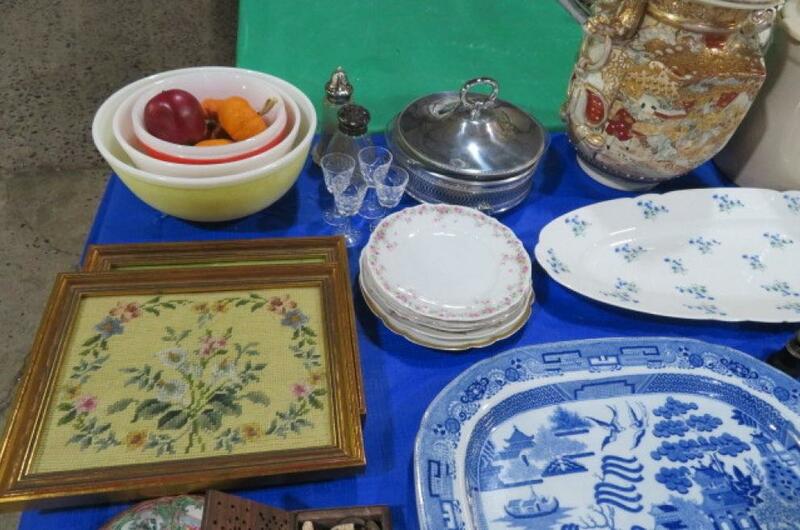 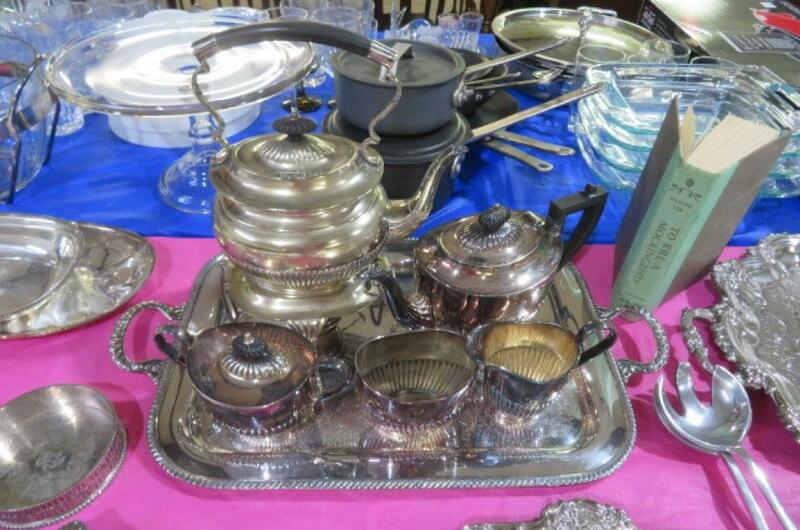 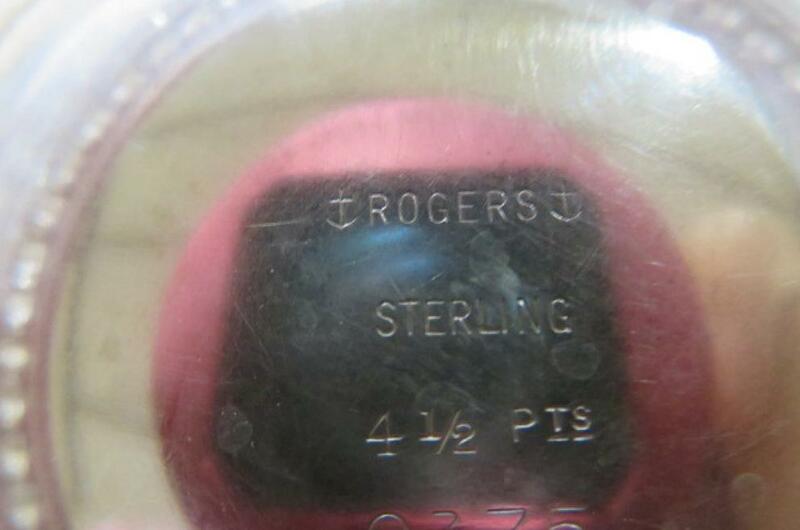 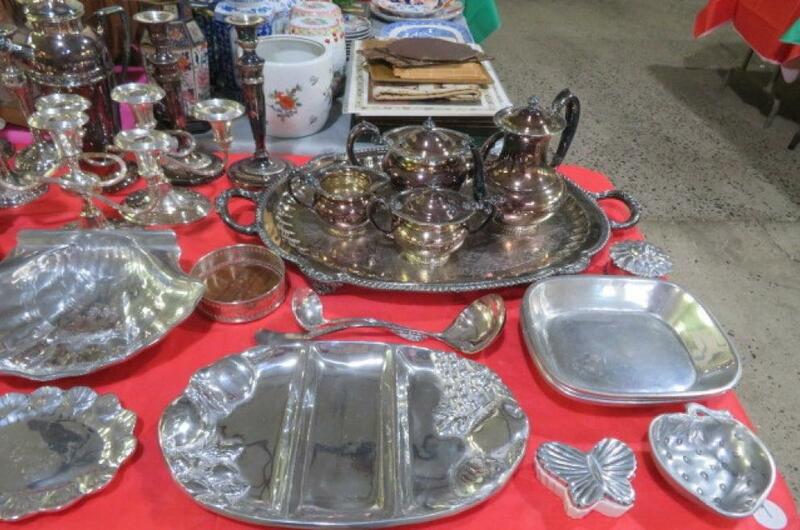 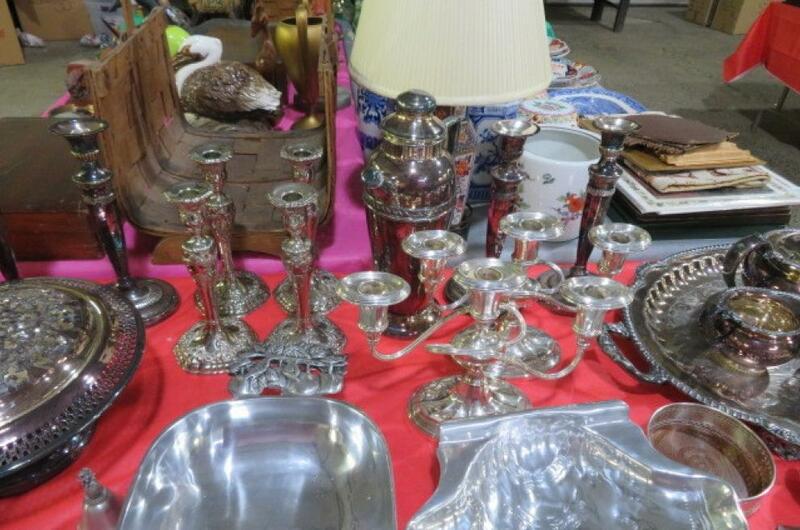 Large Rogers Sterling Pitcher; More Sterling & Silver-plate; Flatware Sets in Case; Tea Set on Tray; Scallop Shell Dish; Serving Pieces; Ladles; Candlesticks; Candelabras; Ornate trays; Knife & Fork in case; Condiment castor; Basket; Coasters; Vases; Pitchers; Chafing Dish; Cordials and Much, Much More! 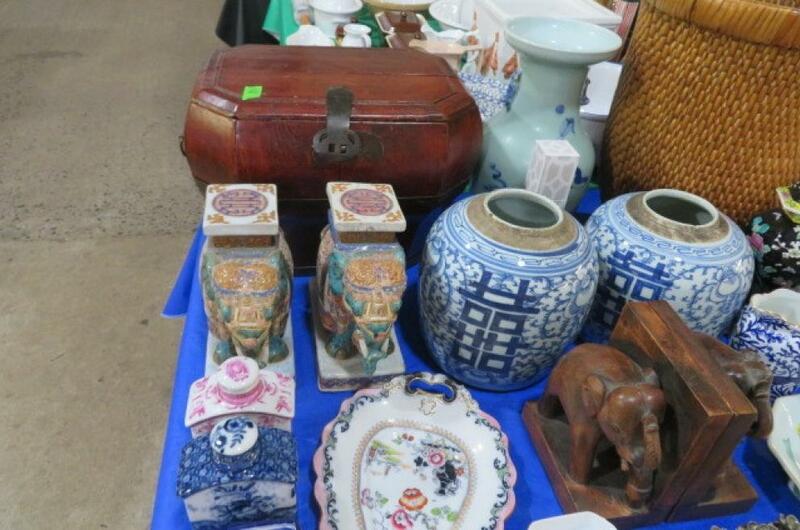 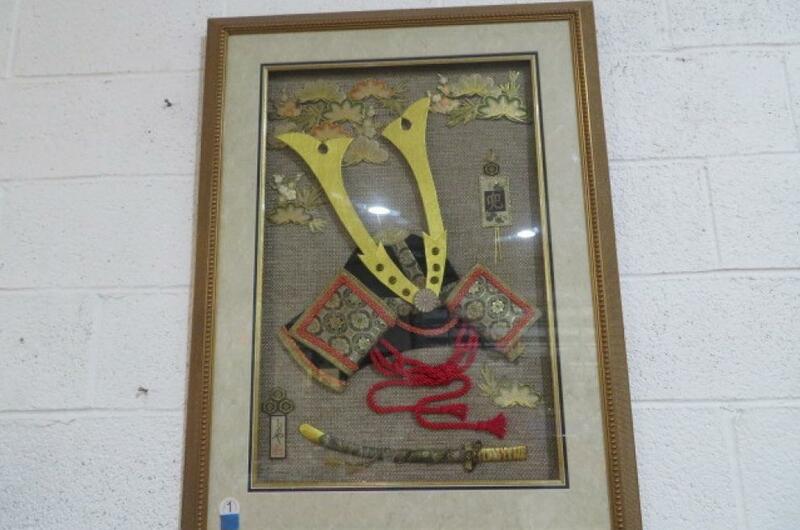 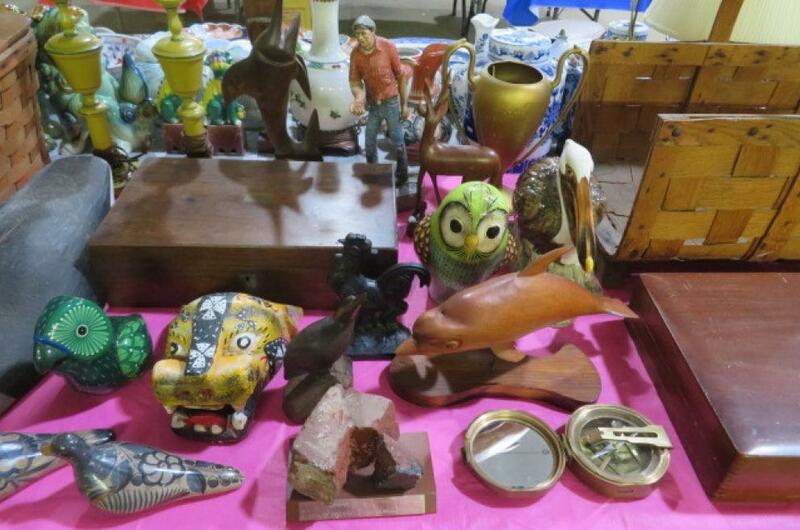 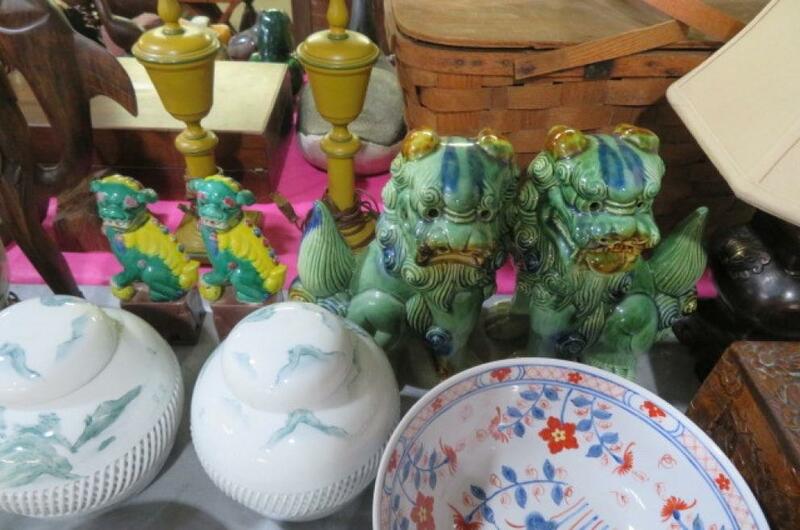 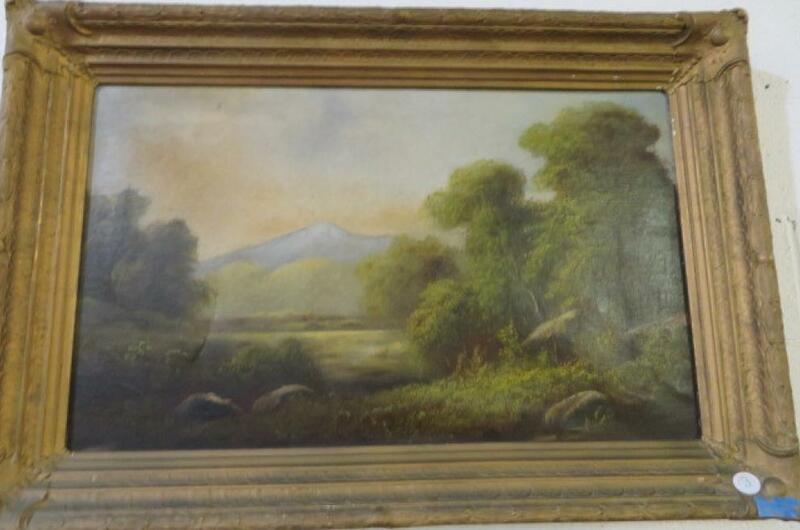 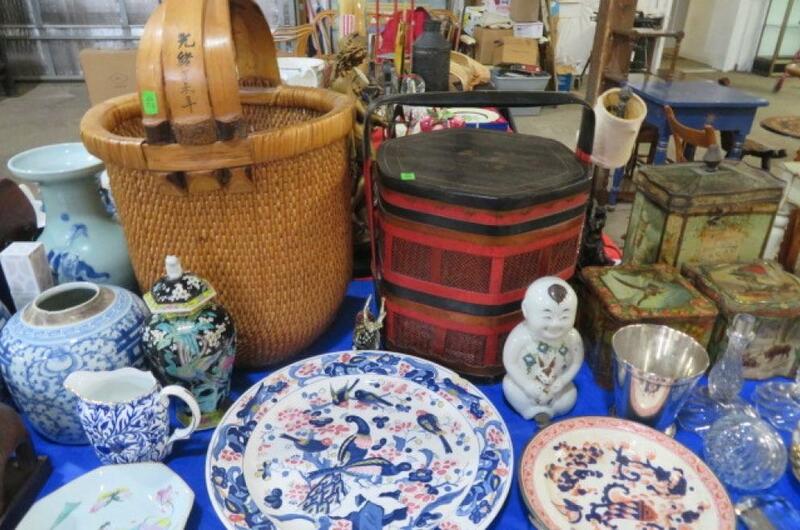 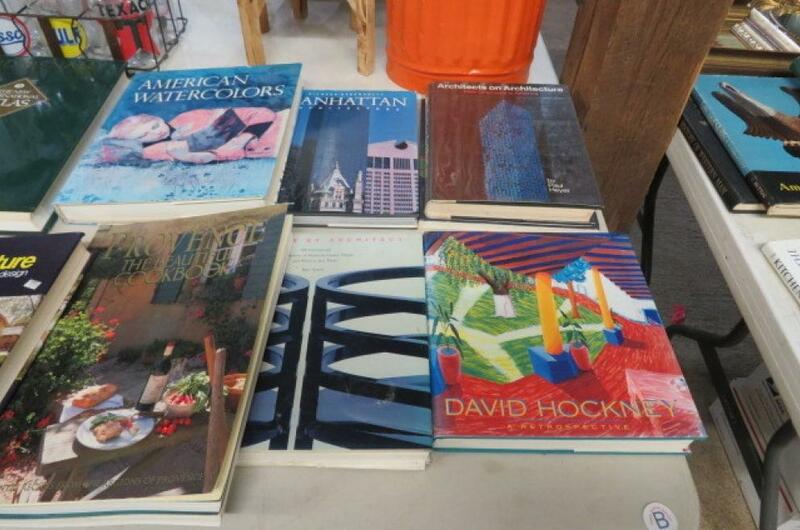 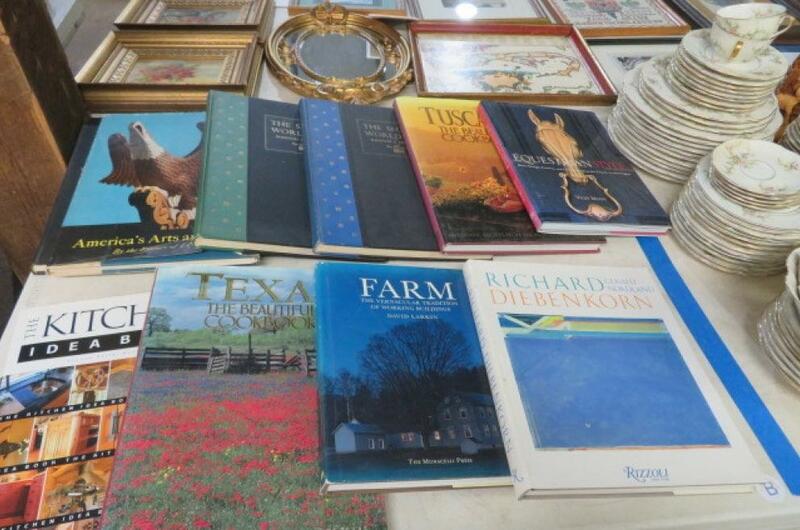 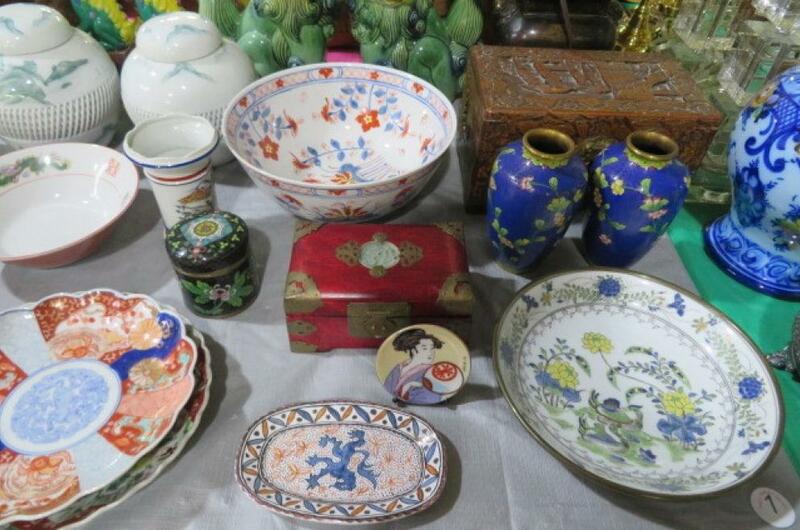 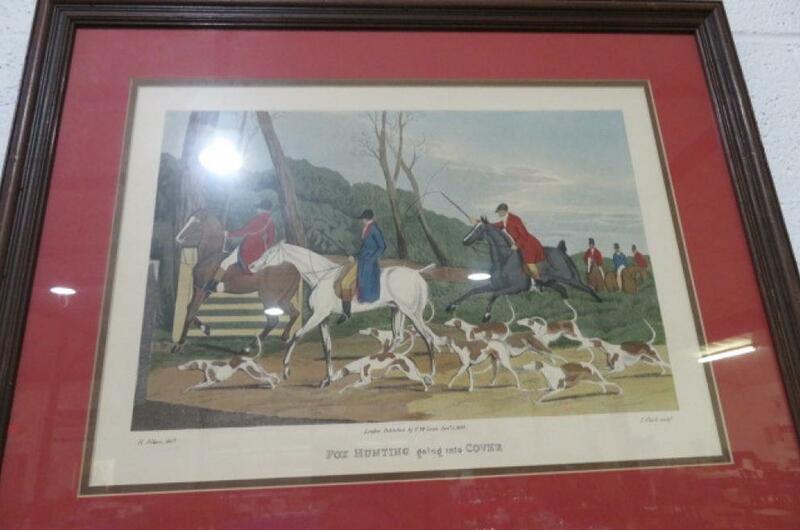 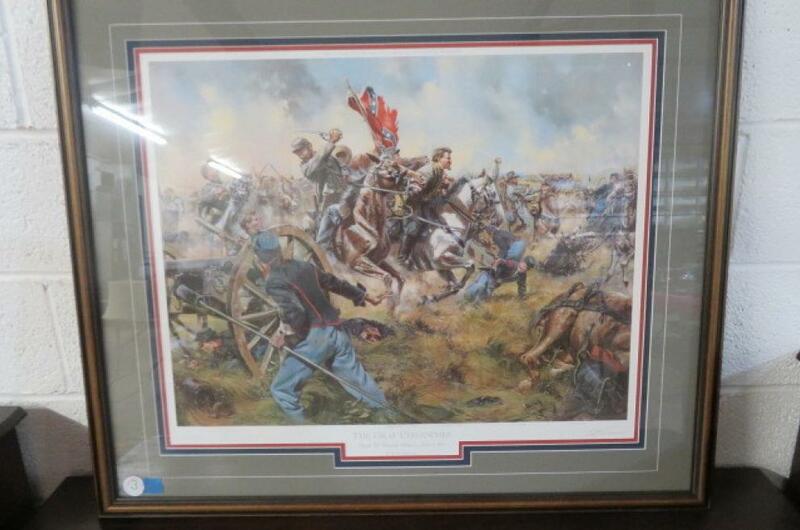 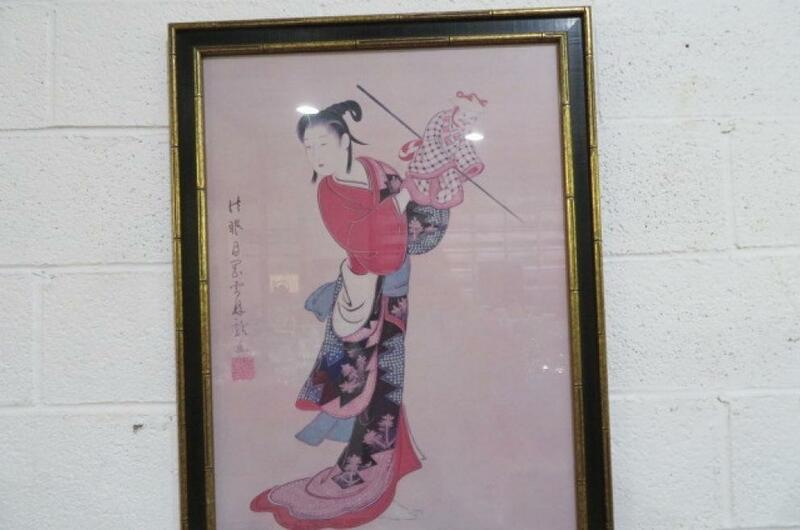 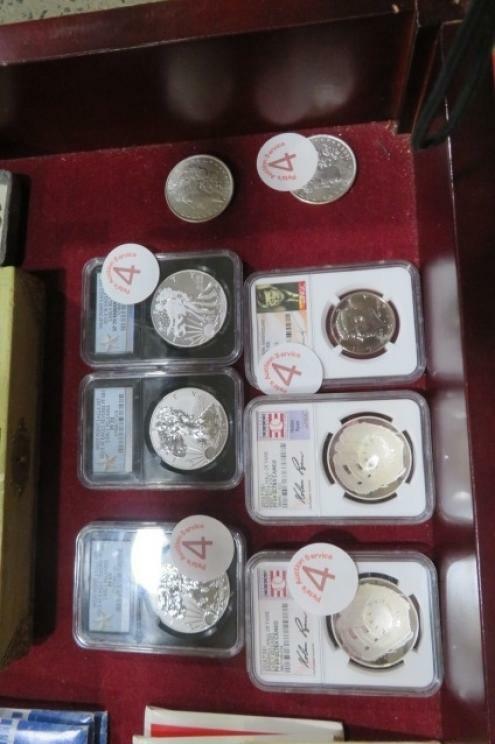 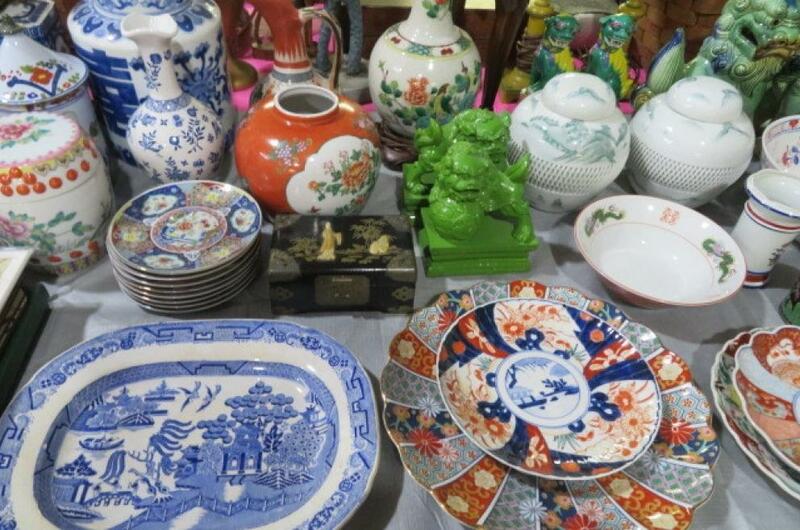 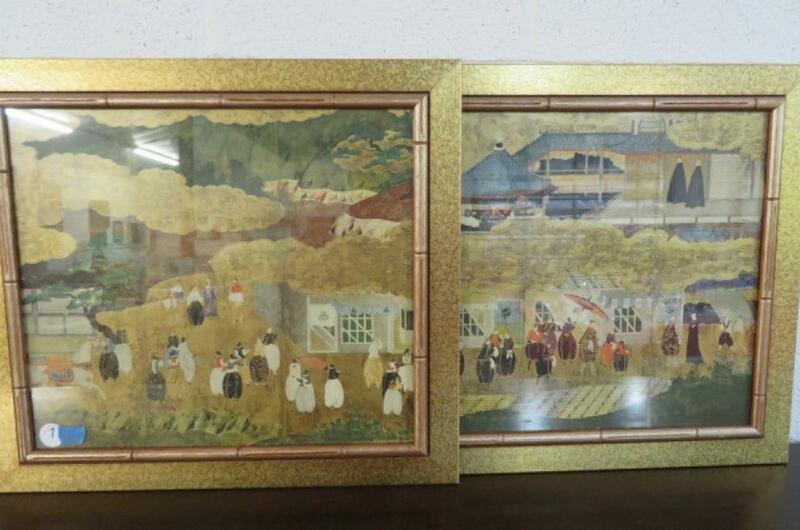 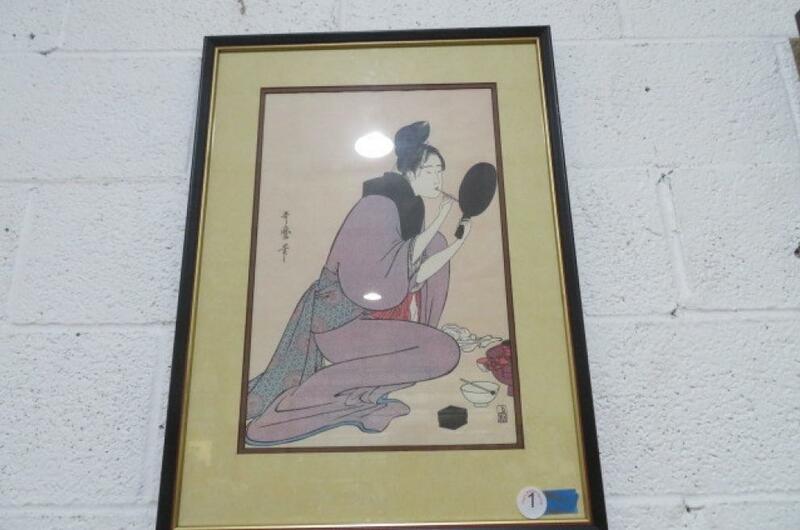 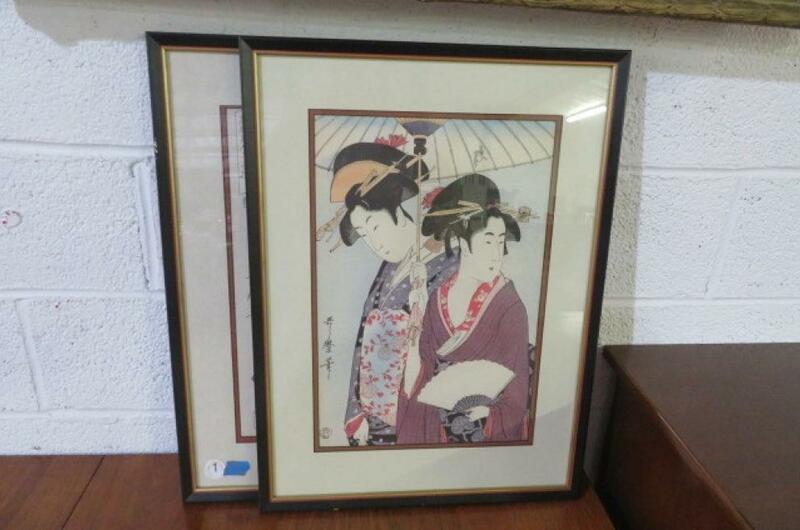 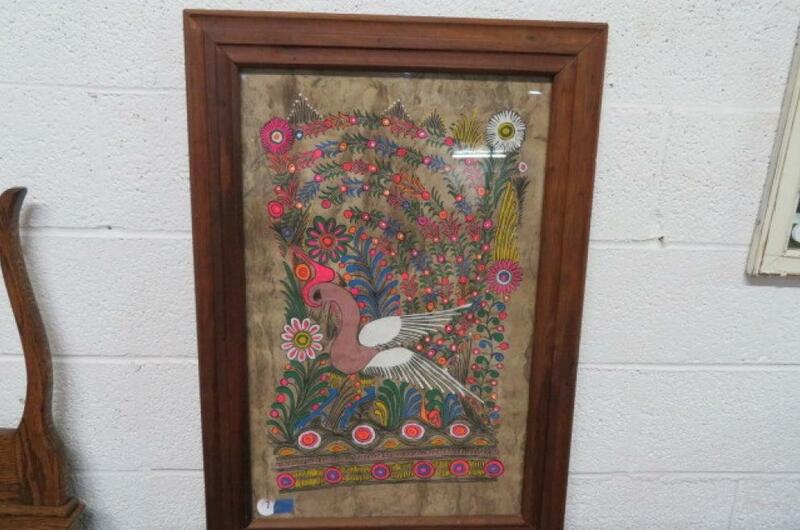 Hunting Print; Japanese Prints; Samurai Art; Stained Glass panels; Geisha Artworks; Original Landscape; Ship Model; More Good Art; Civil War Print; Middle American Pottery Figures; Carved Dolphin; Owls, Pelican Figure; Carvings and More! 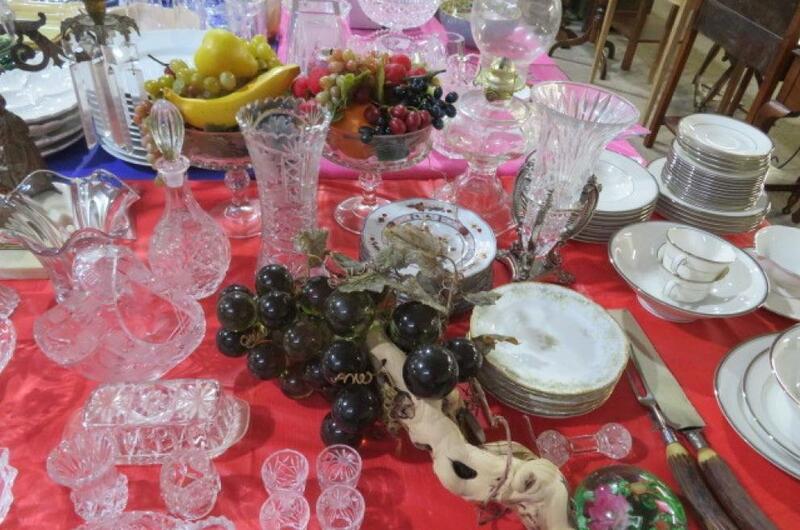 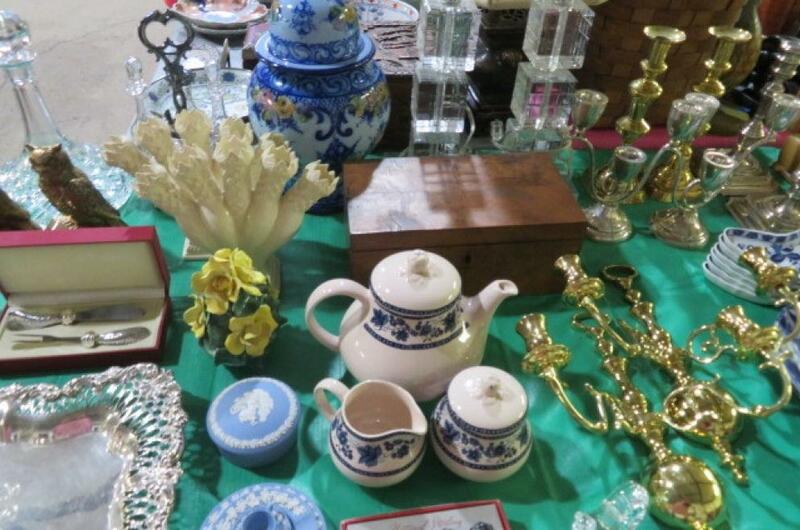 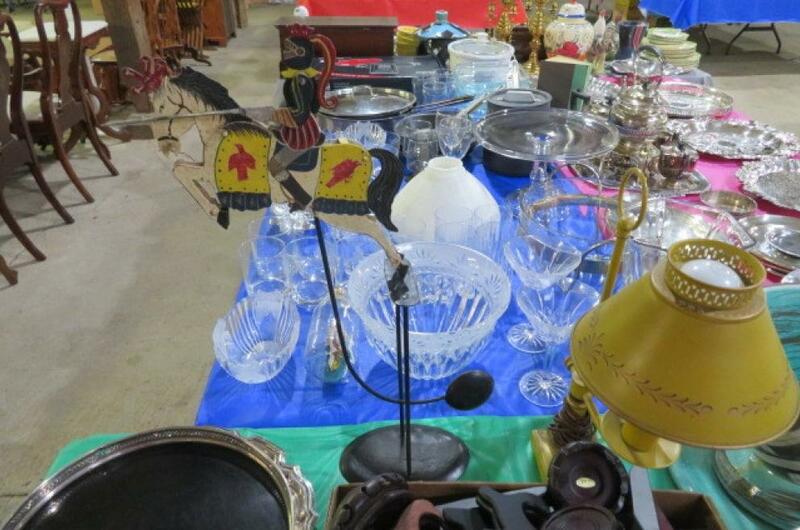 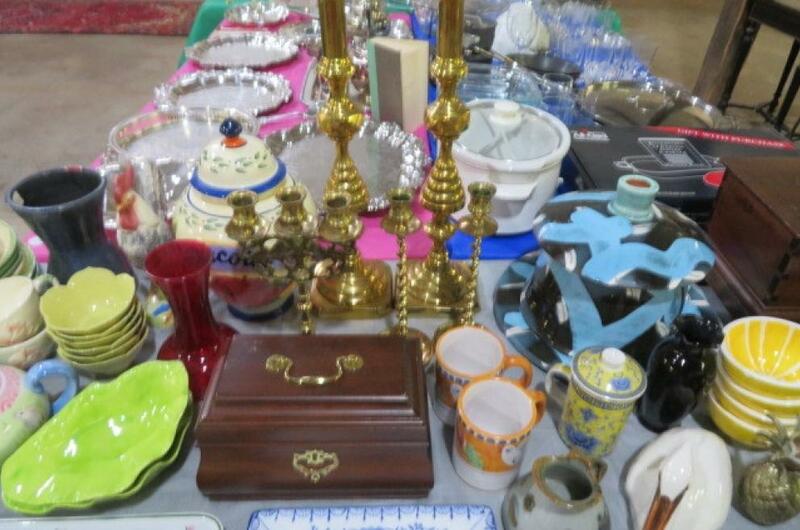 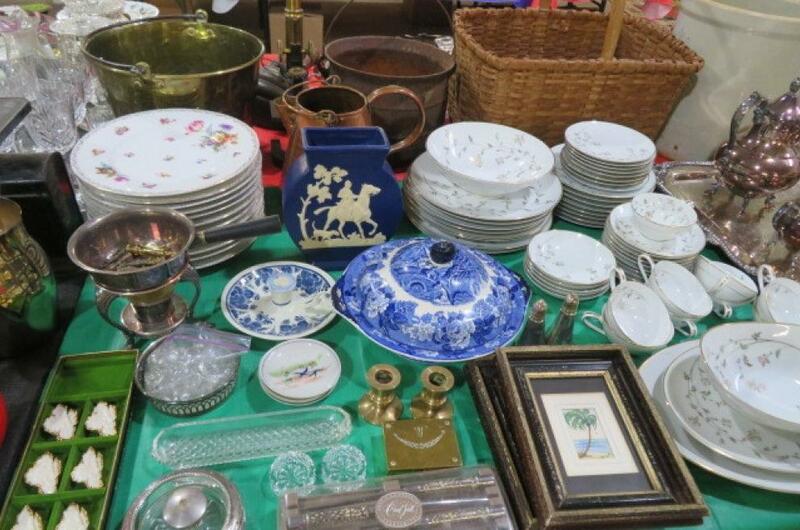 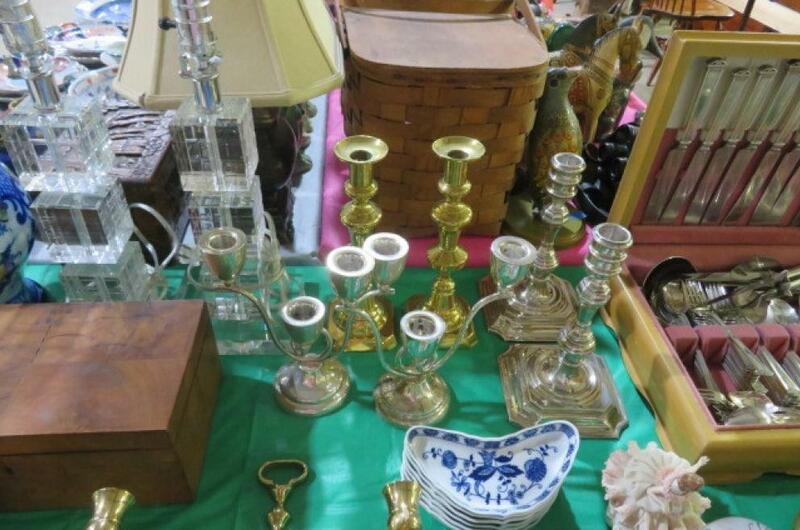 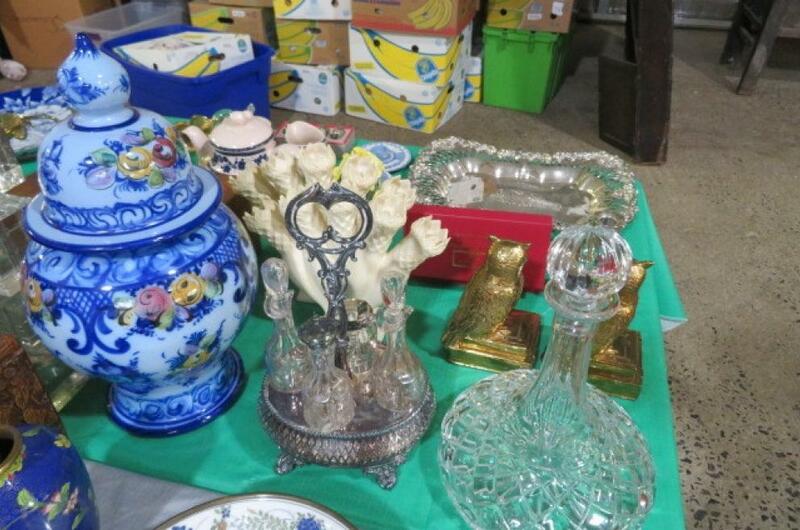 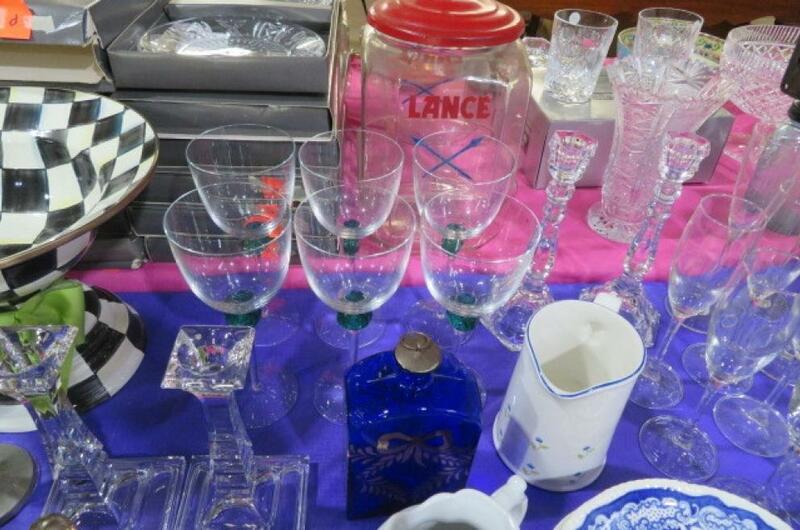 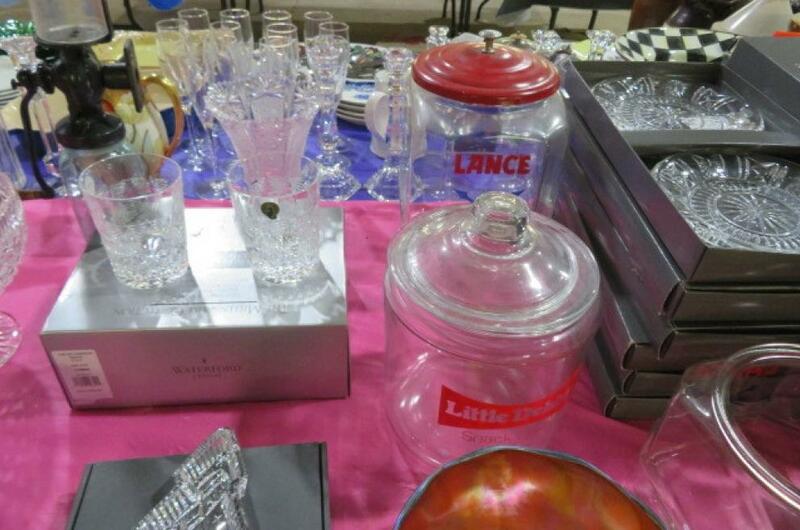 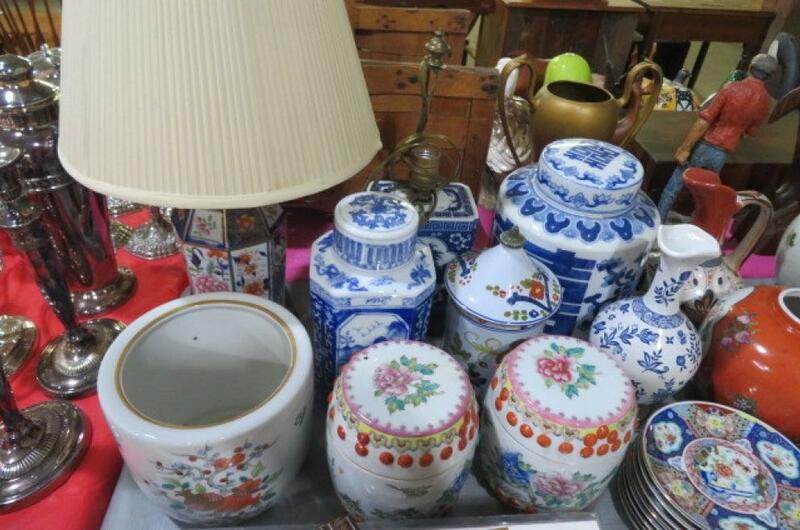 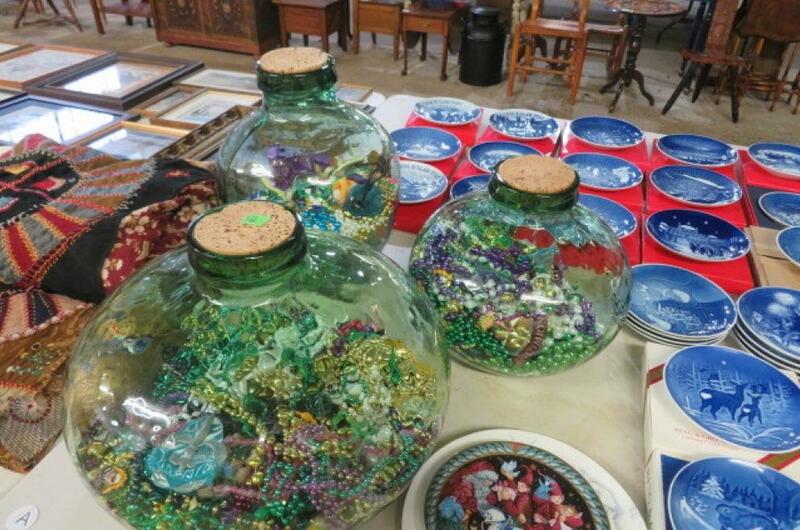 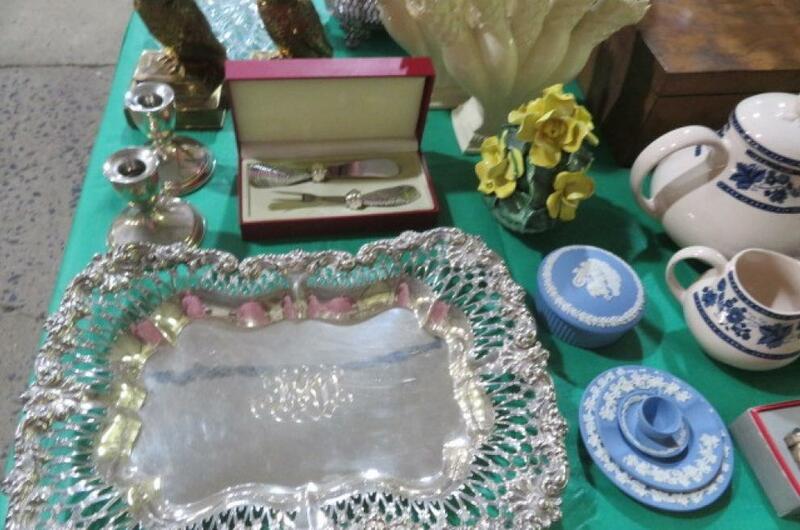 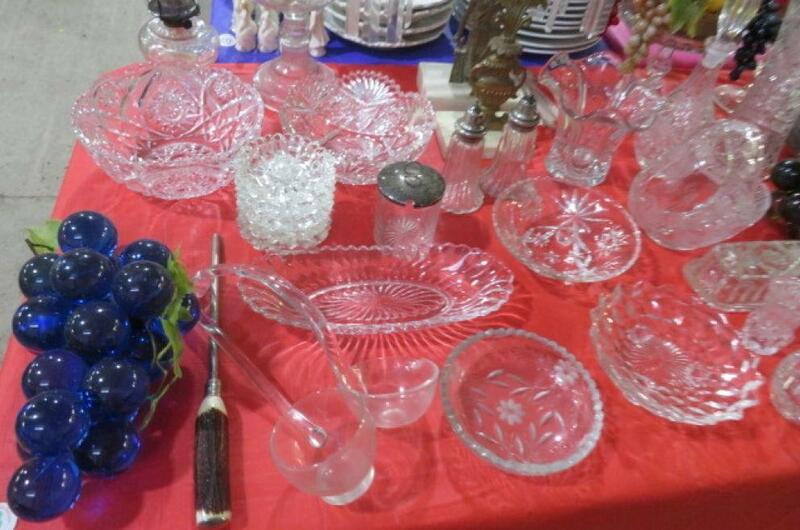 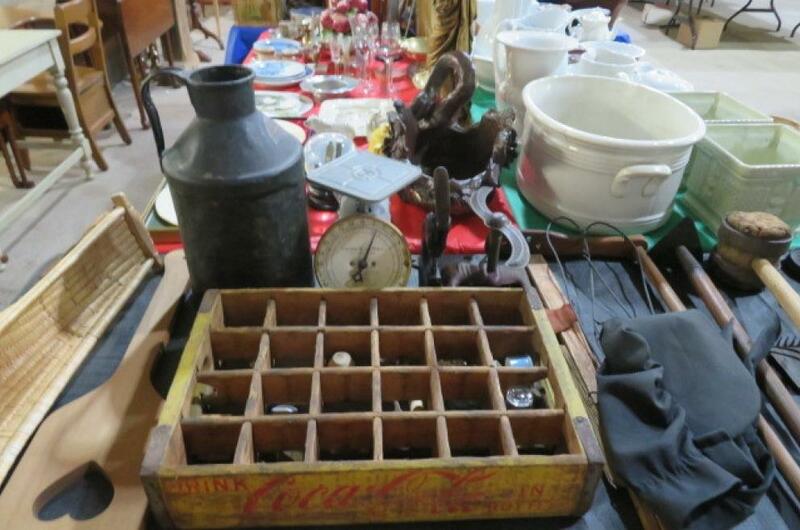 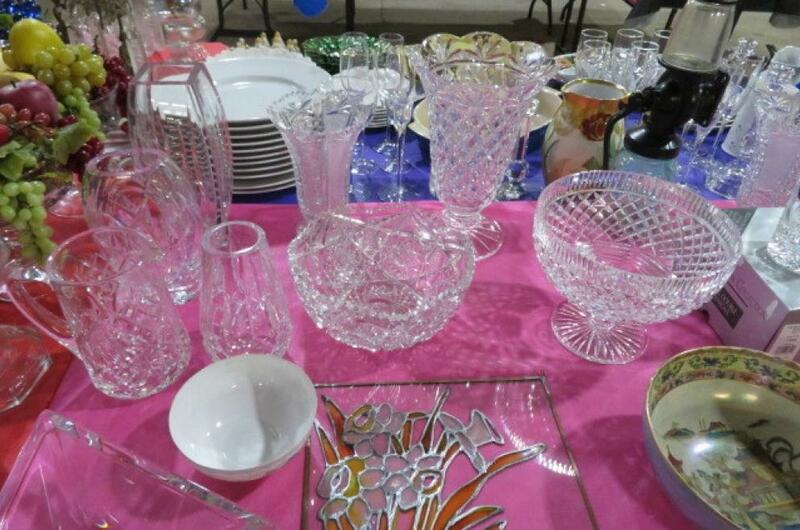 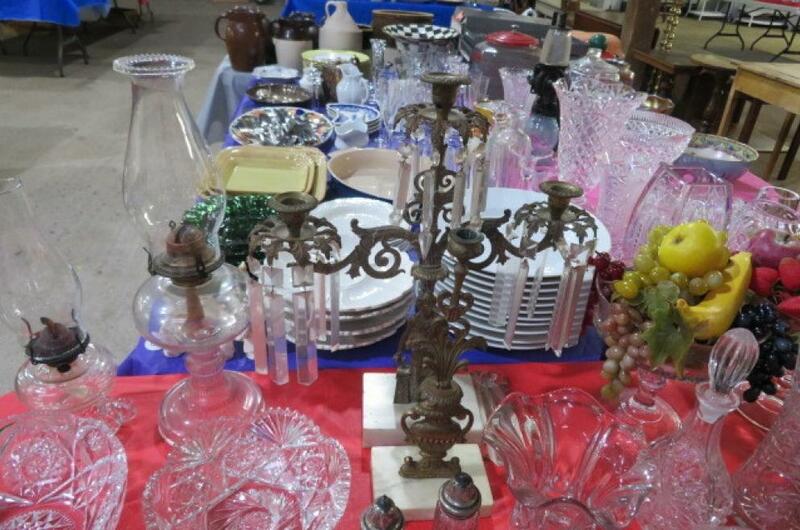 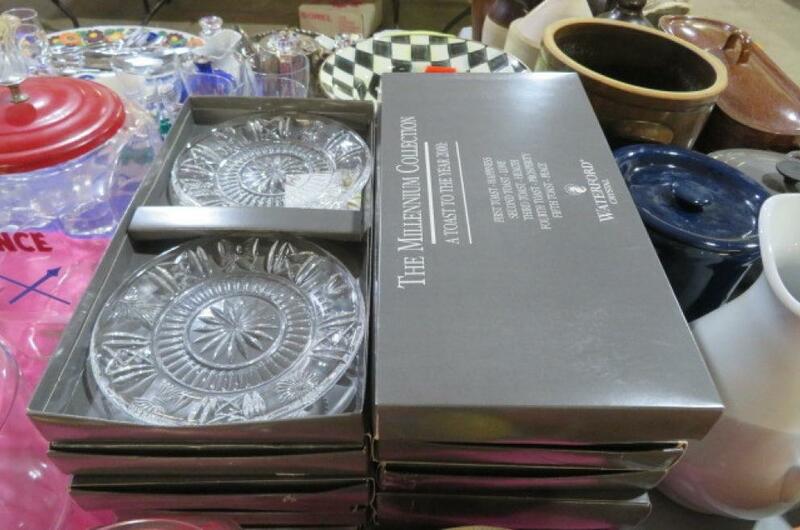 Waterford Millennium Collection in Boxes; Waterford Tumblers and Christmas Tree Tray in boxes; Crystal ship’s Decanter & Vases; Crystal Footed Bowl; Art Glass Fish; Jadeite Bowl; More Mixing Bowls; Butter Dish; Oil Lamps; Candelabras with Prisms; Bowls; Stemware and More! 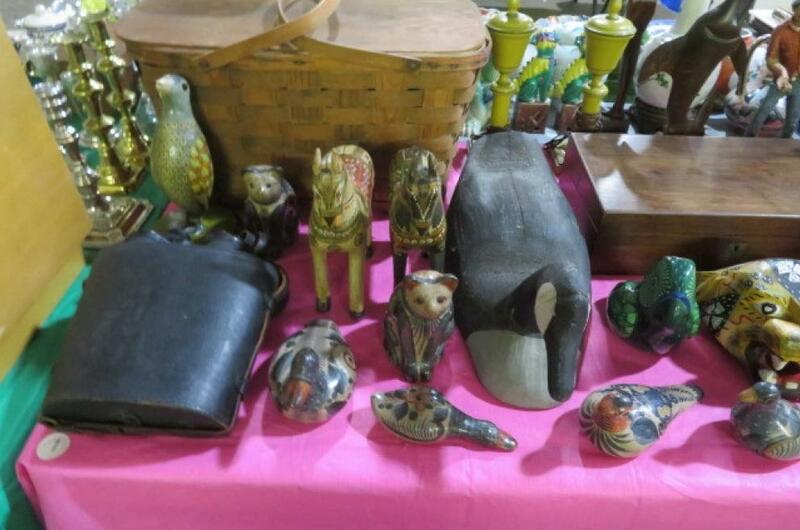 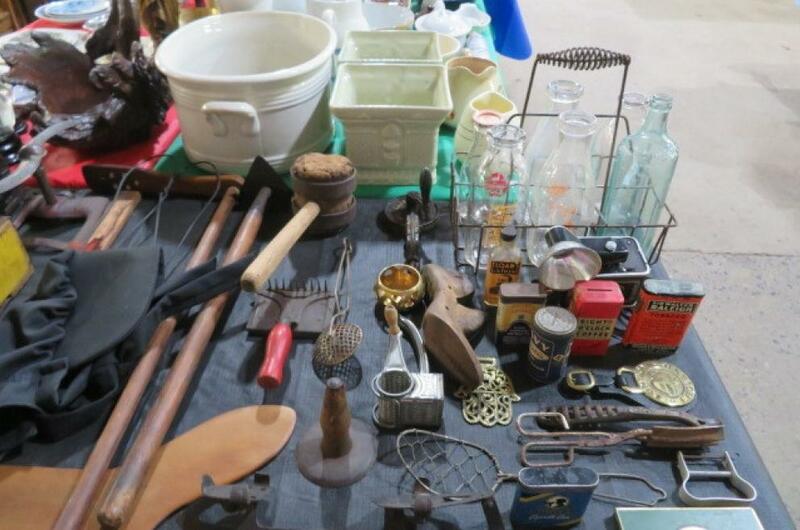 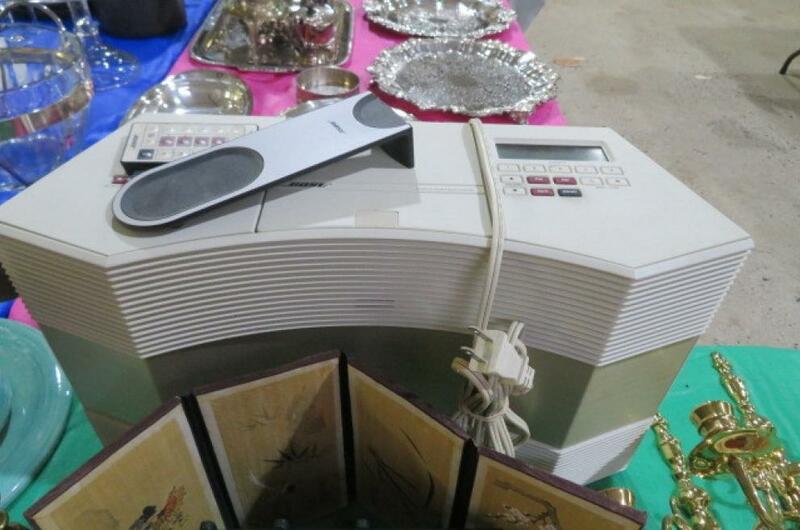 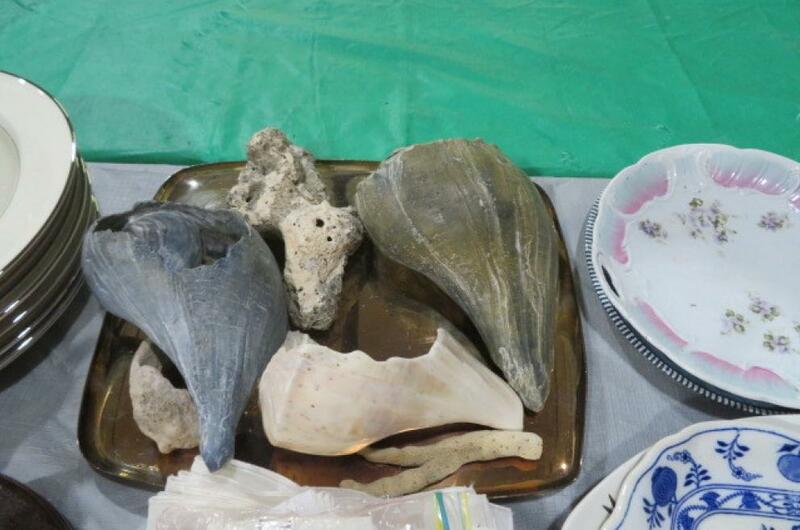 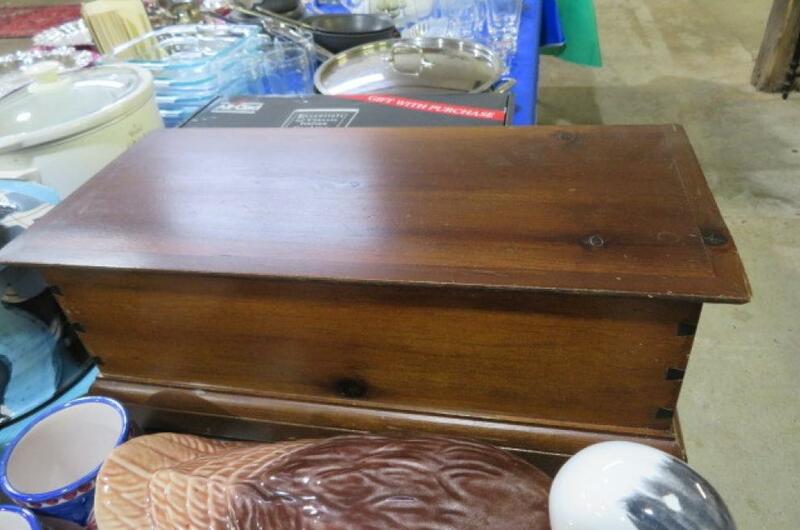 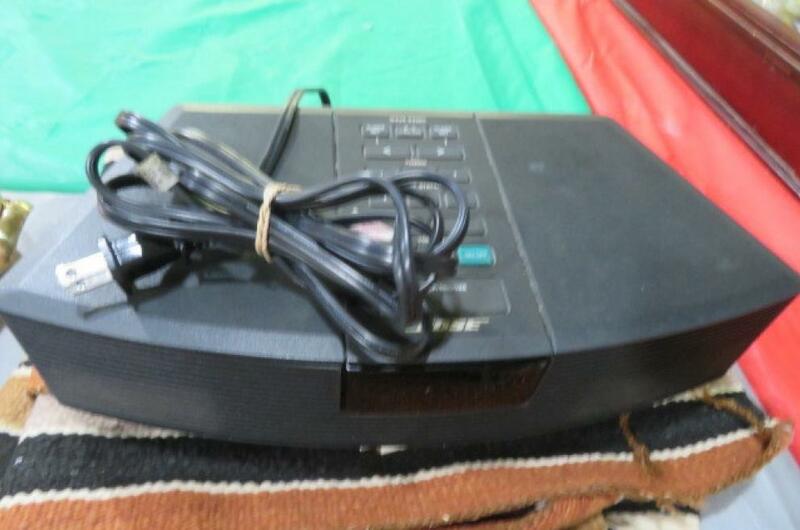 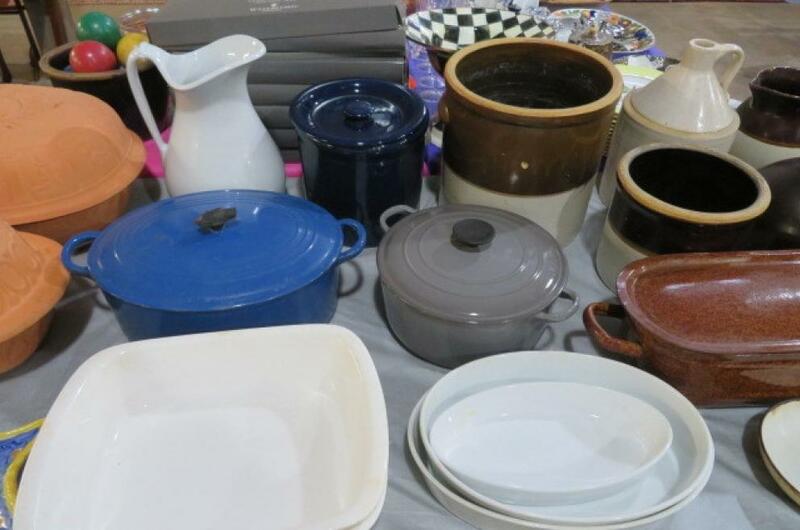 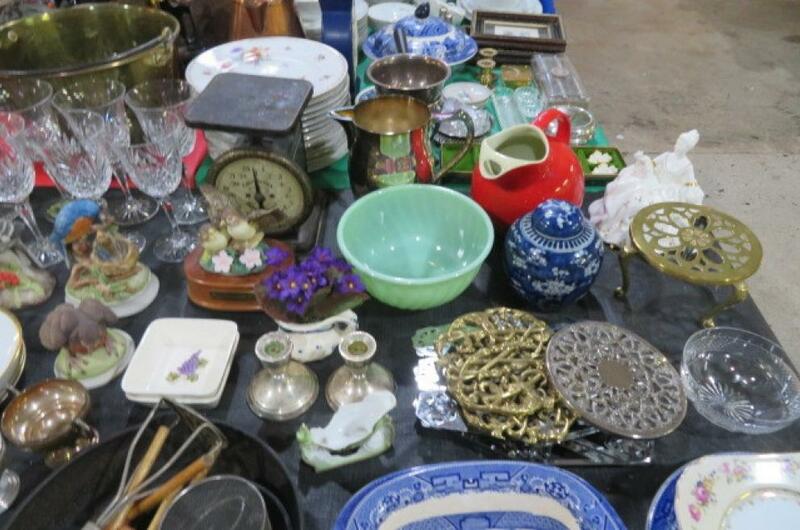 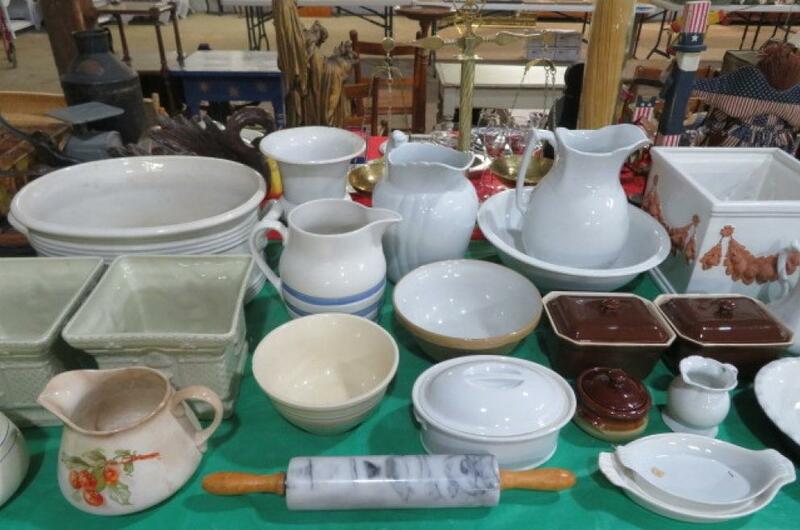 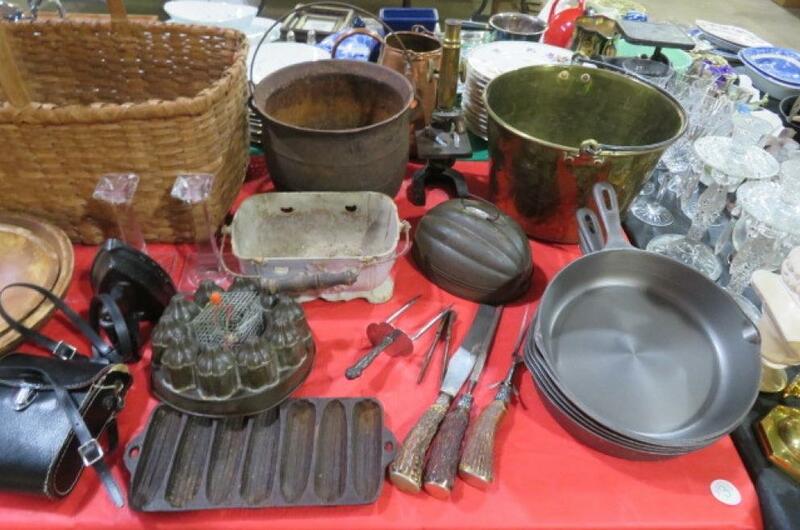 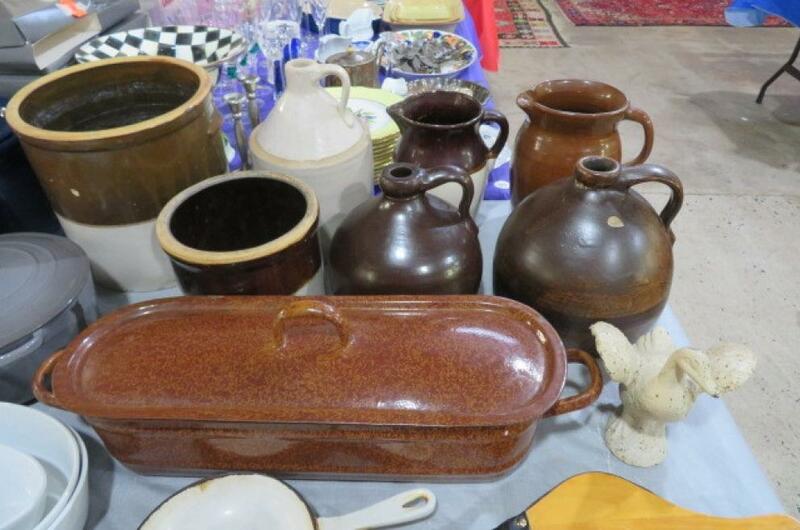 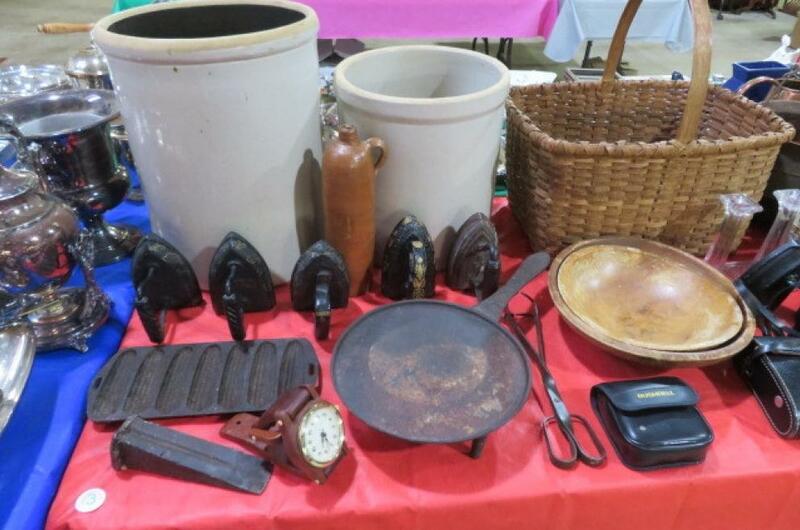 Canada Goose Decoy; Binoculars; Crock Pots; Cookware Sets; Pots & Pans; Bose Systems; Pickling crocks; Sad Irons; Footed Griddle; Corn-stick Pan; Maul; Tongs; Stoneware Jug; Nice Basket; Wooden Bowls; Molds; Brass Bucket; Iron Kettle; Enamelware Dutch Ovens; Clay bakers; Corning Ware; Marble Rolling Pin; Bakers; Coffee table Books; Crazy Quilt; Coins; Fine & Costume Jewelry; Proof Sets; Currency and More!